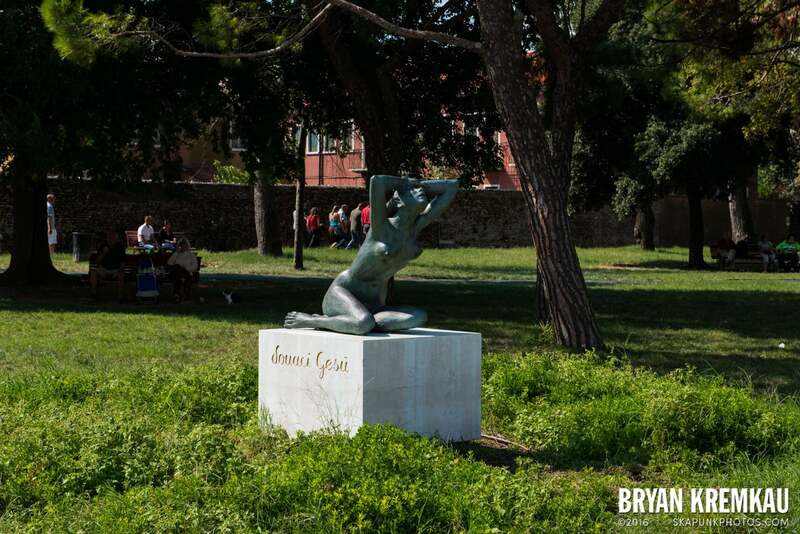 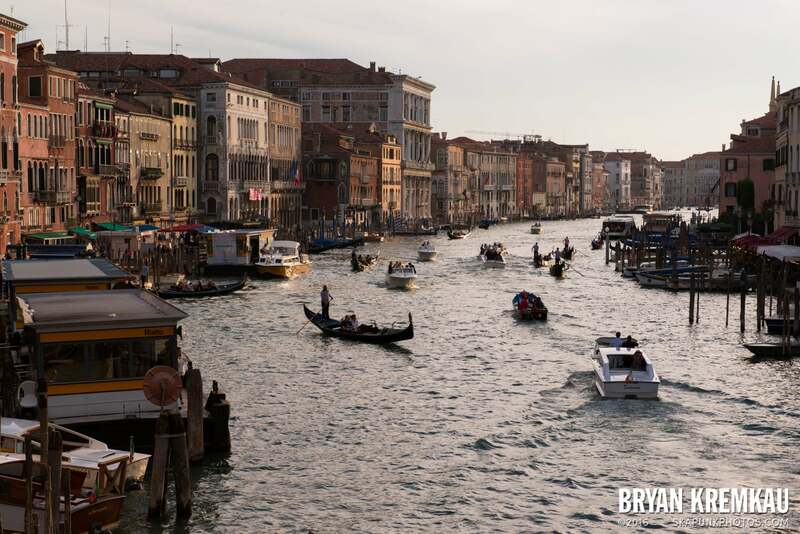 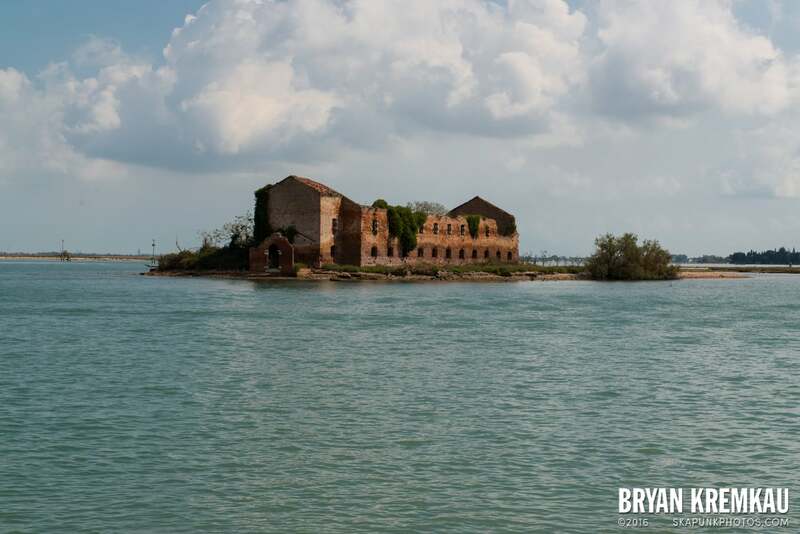 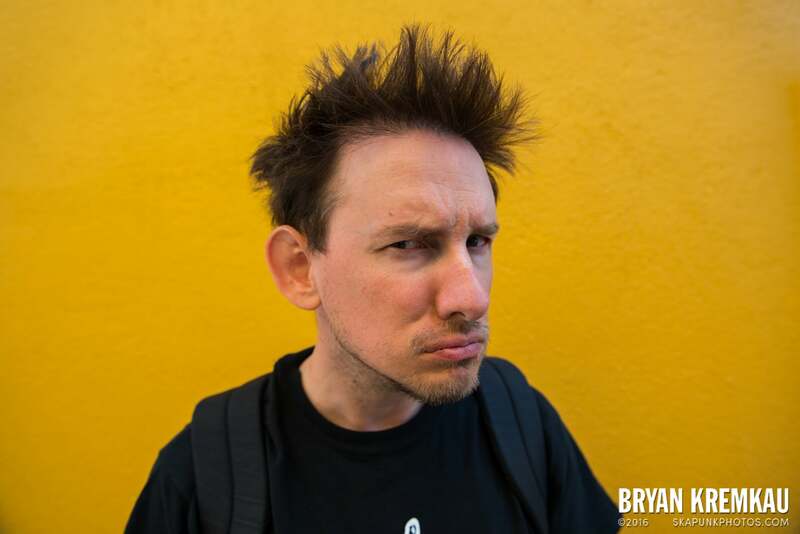 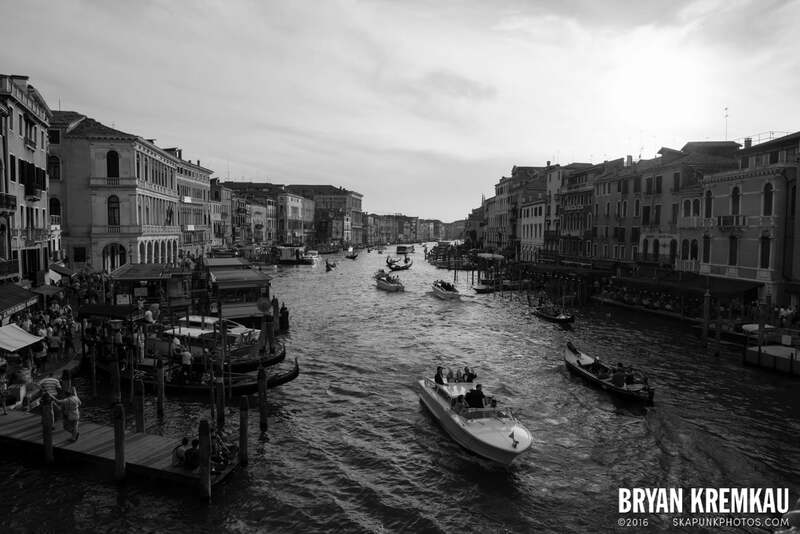 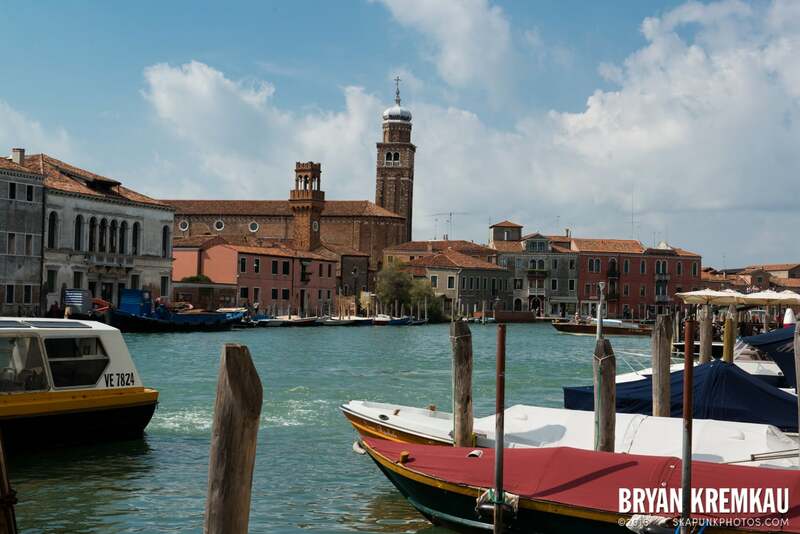 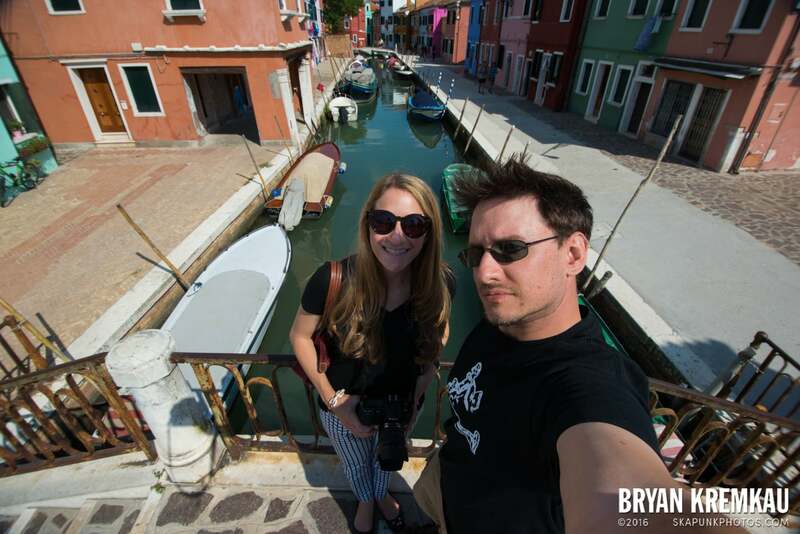 After spending two days in Venice, we decided to take a little bit of a boat ride via the vaporettos to go to nearby islands of Murano and Burano. 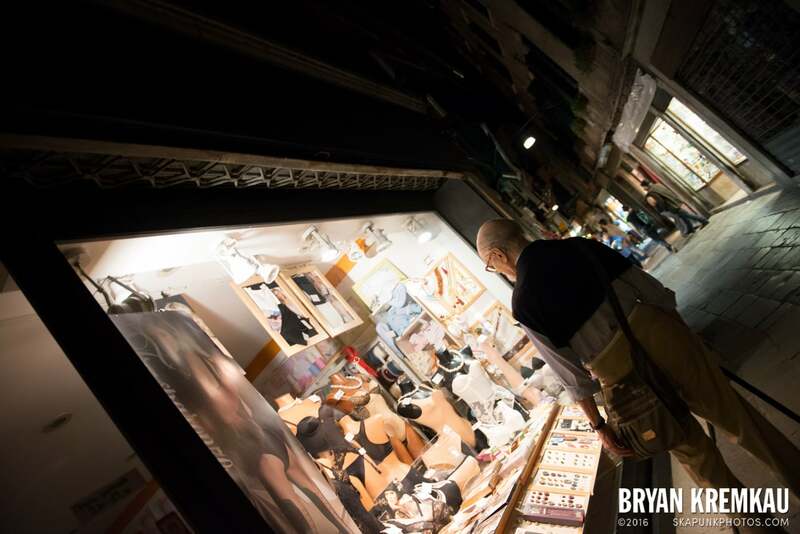 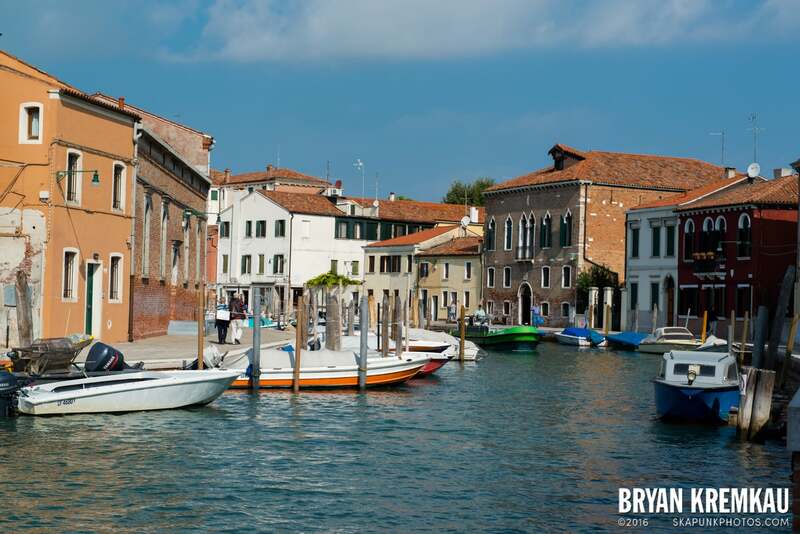 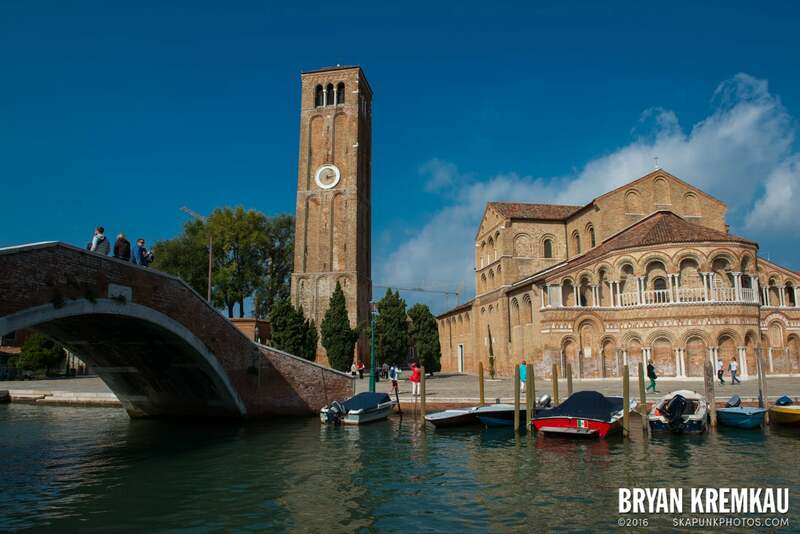 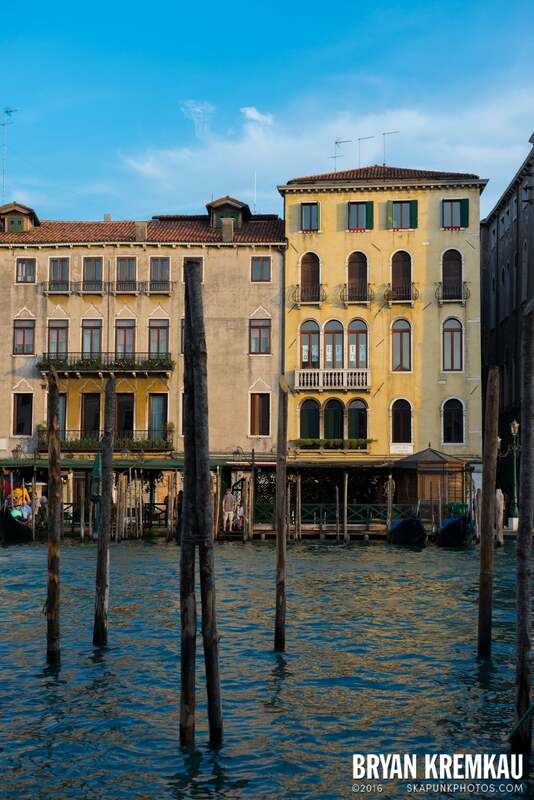 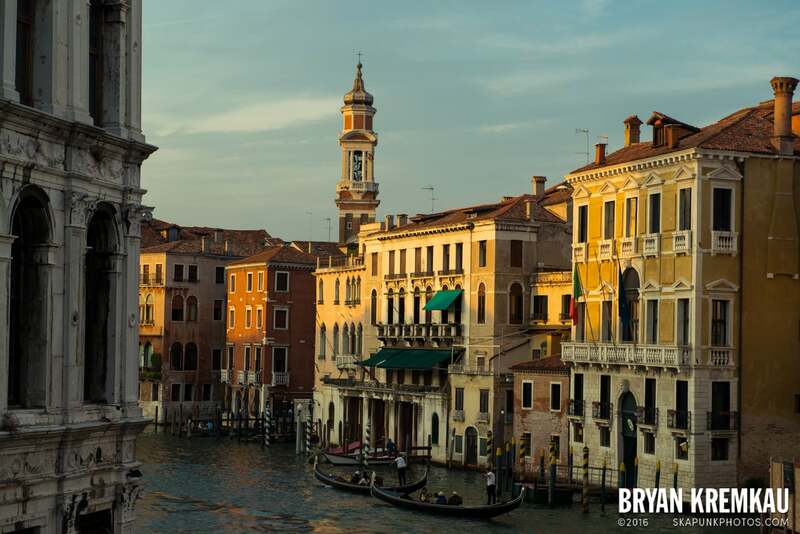 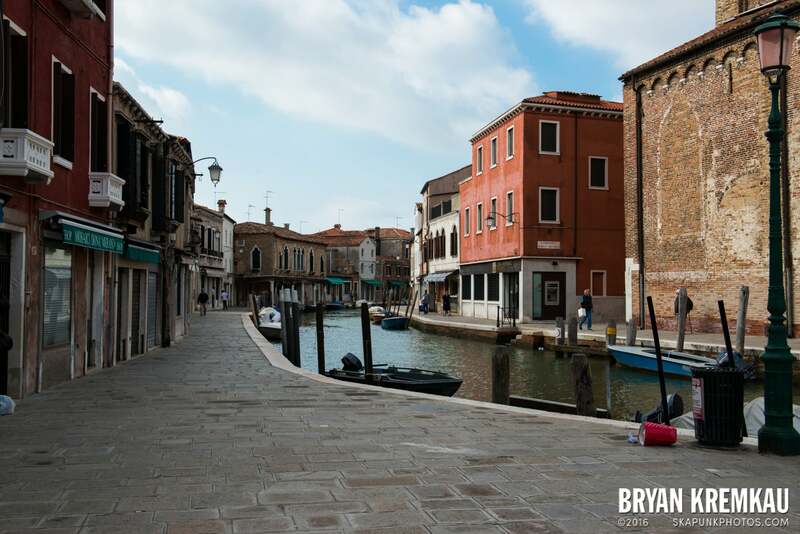 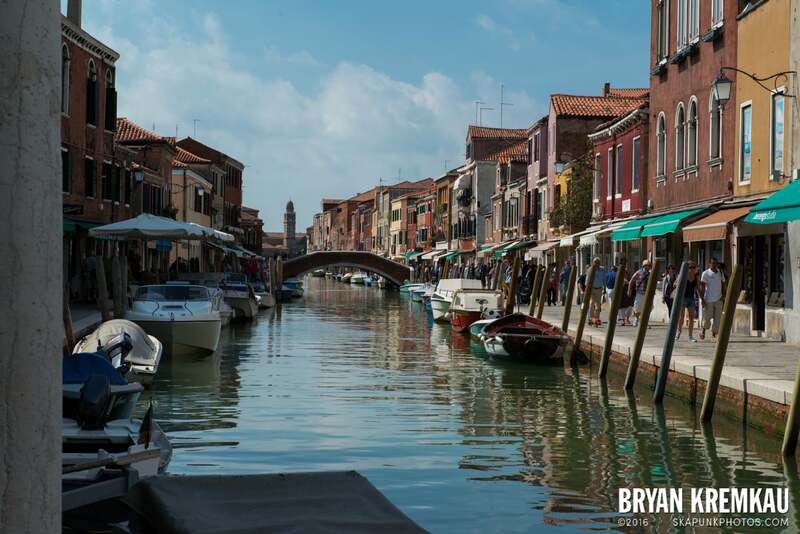 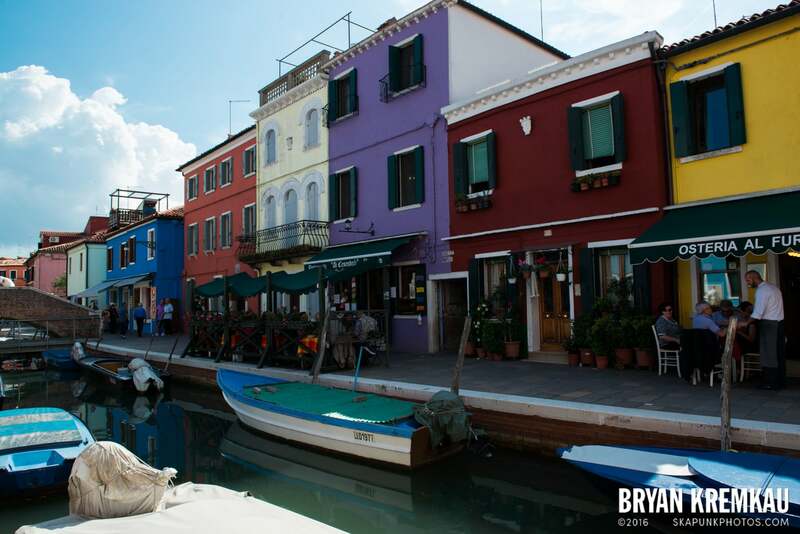 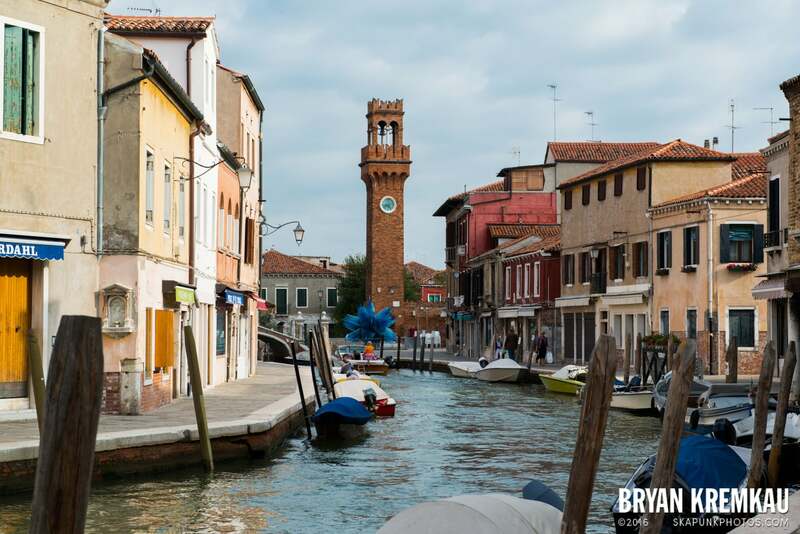 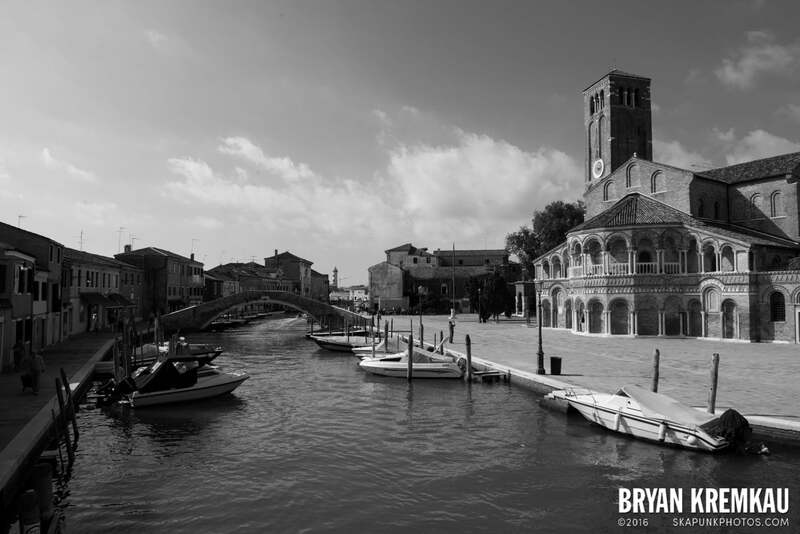 Murano is known for their glass-making and Burano is known for lace and their colorful buildings. 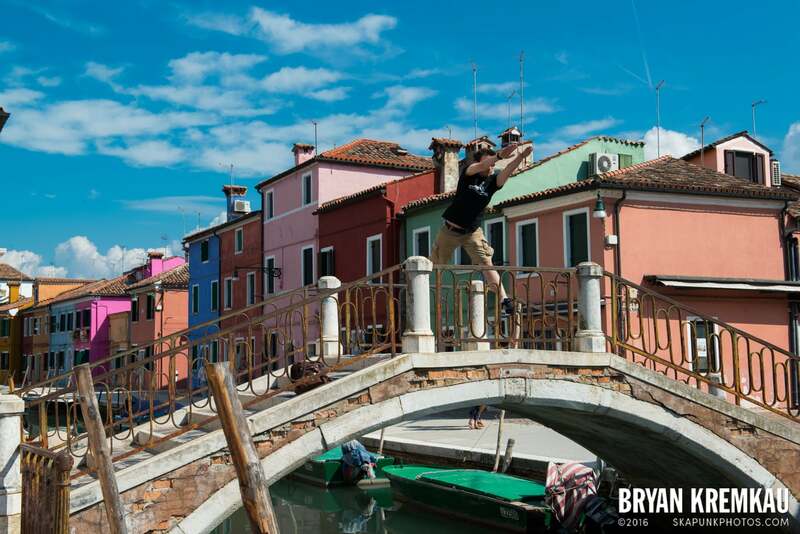 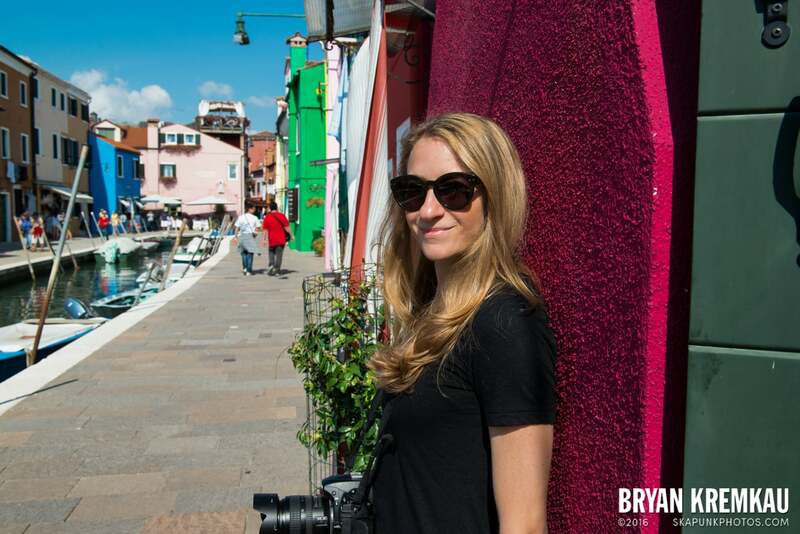 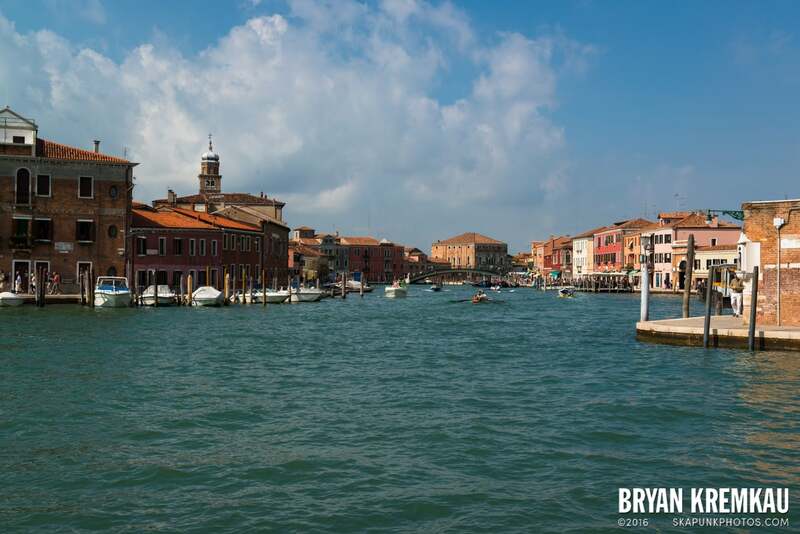 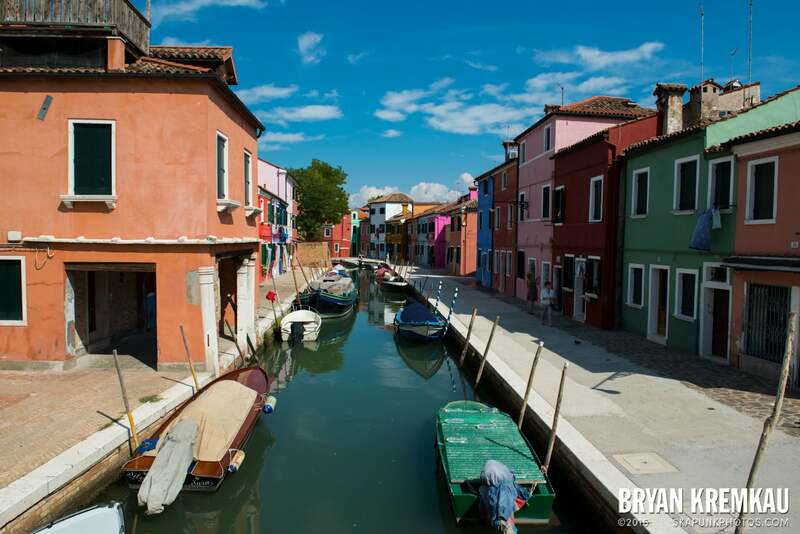 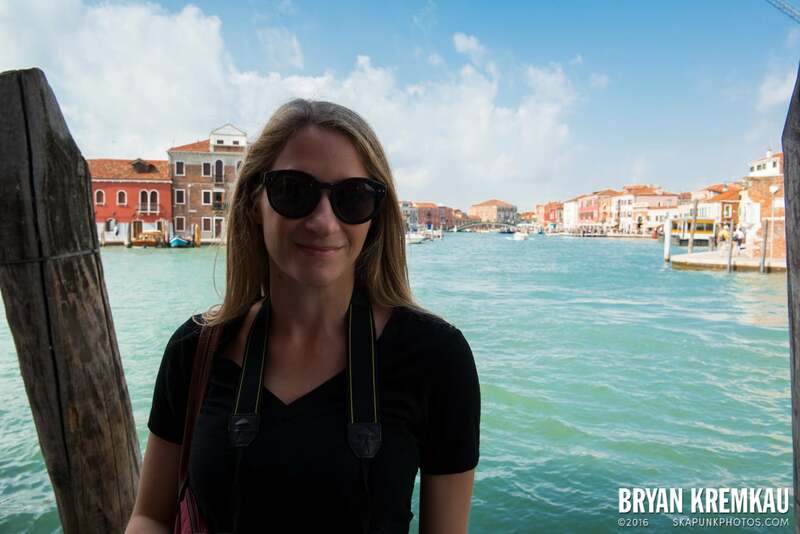 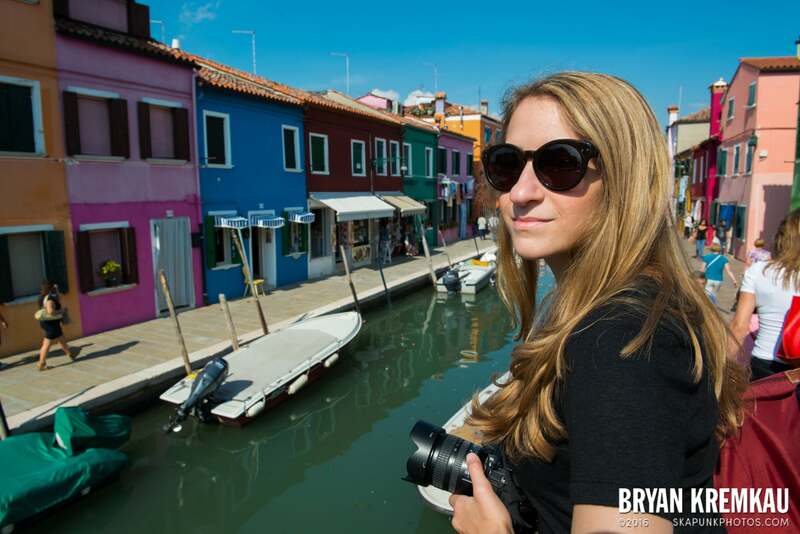 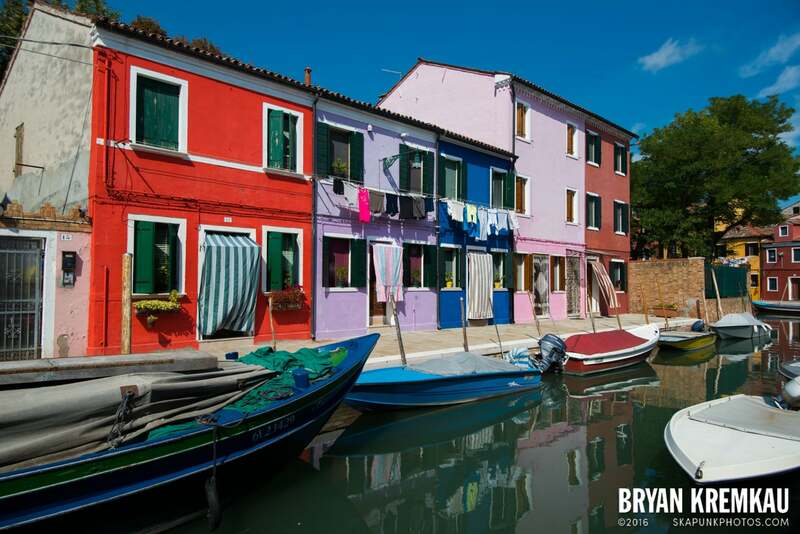 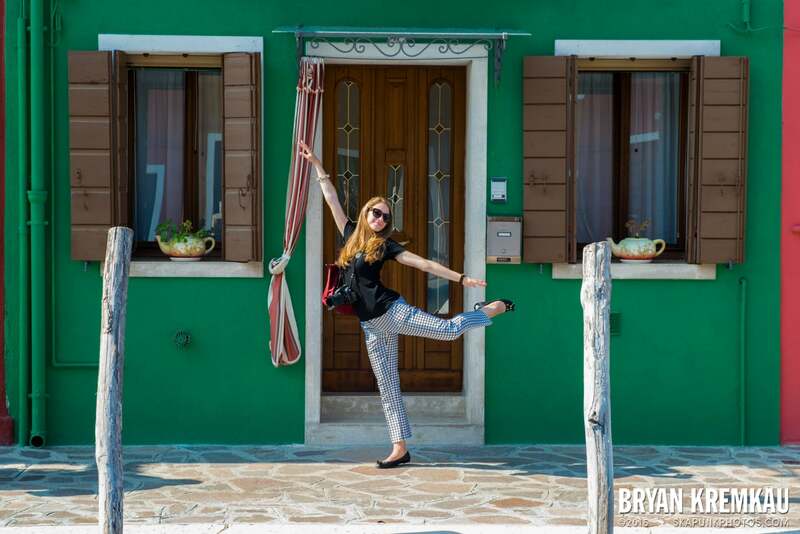 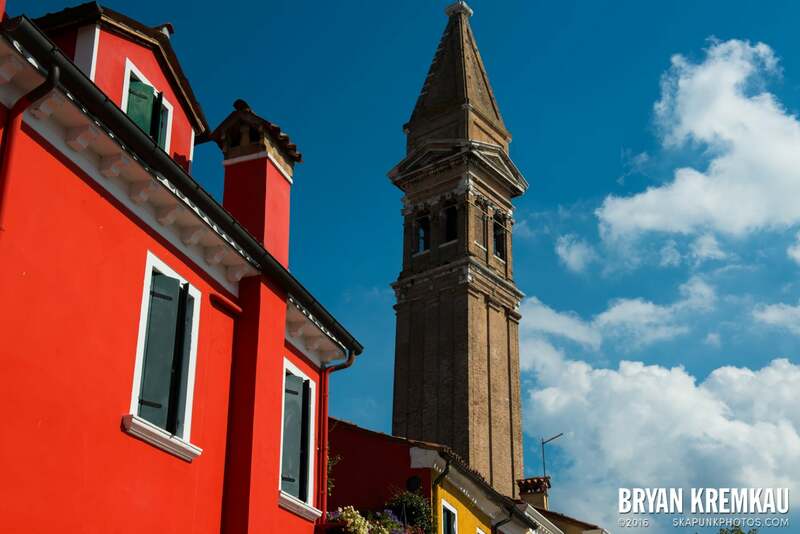 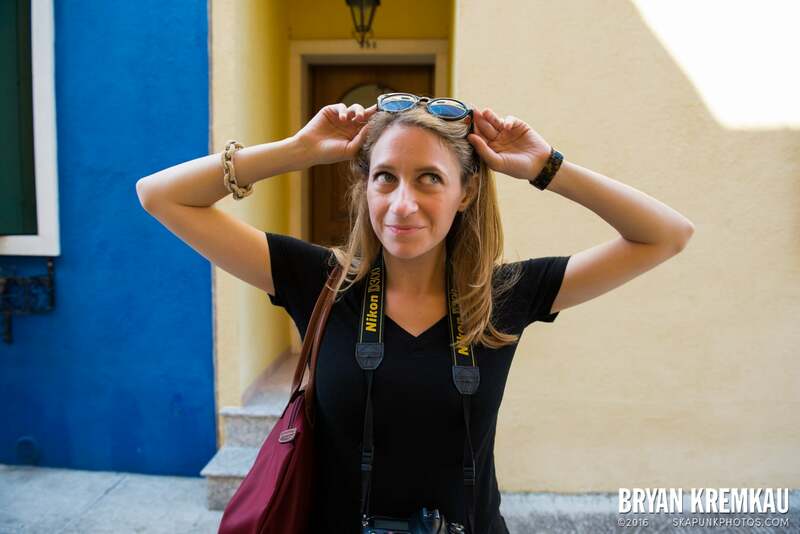 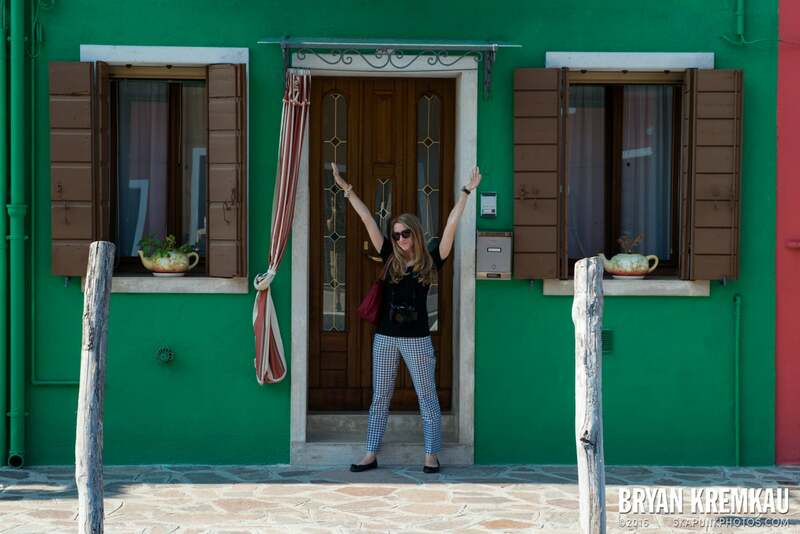 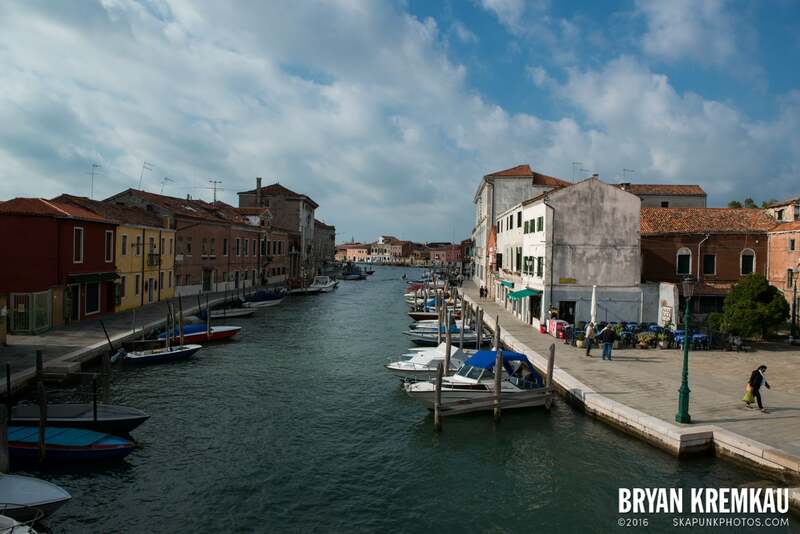 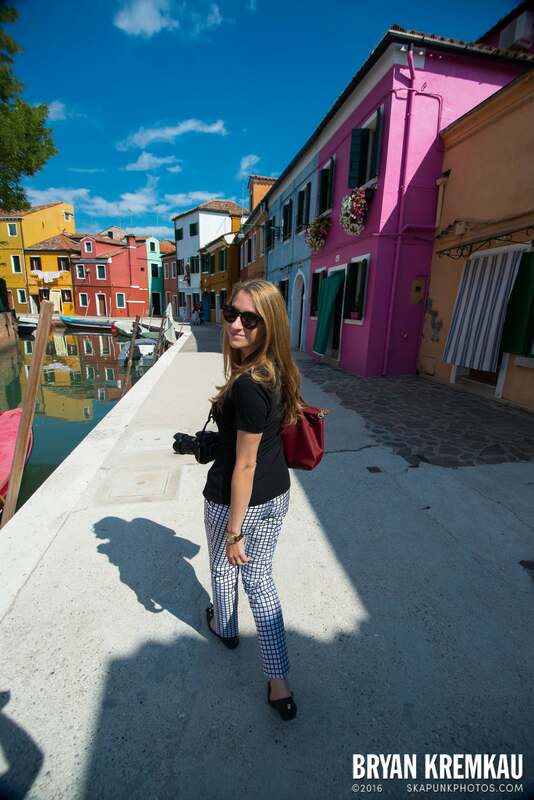 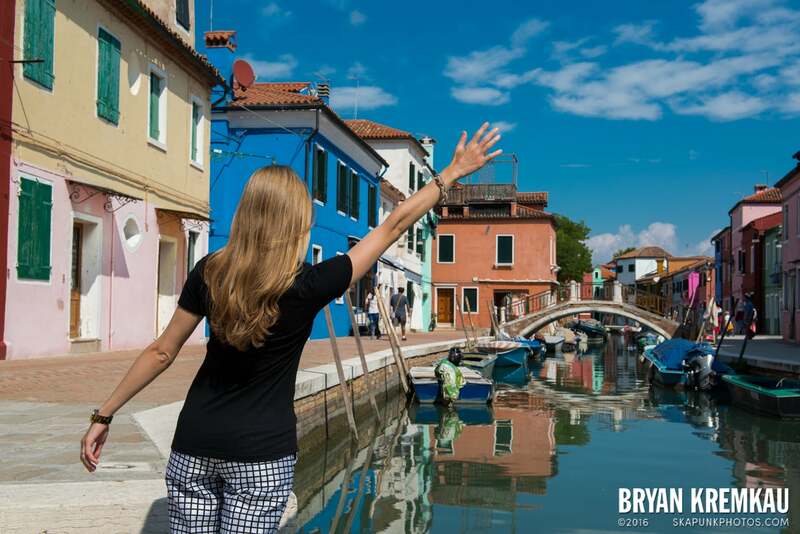 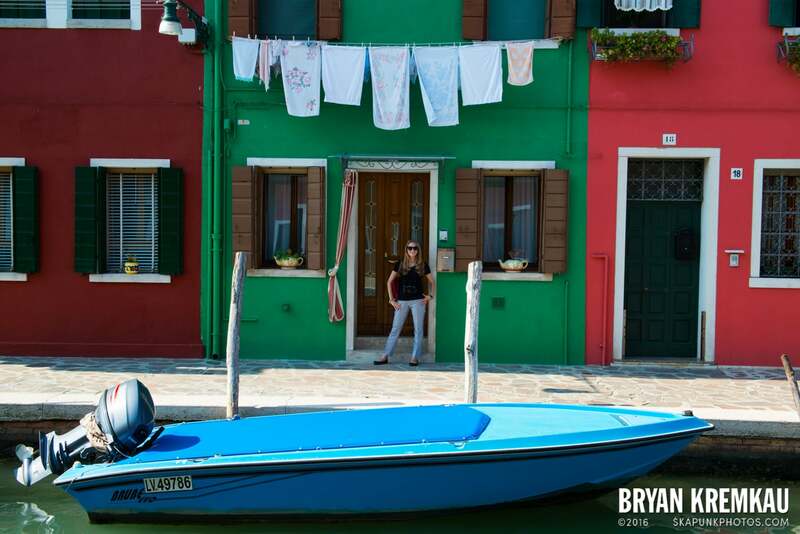 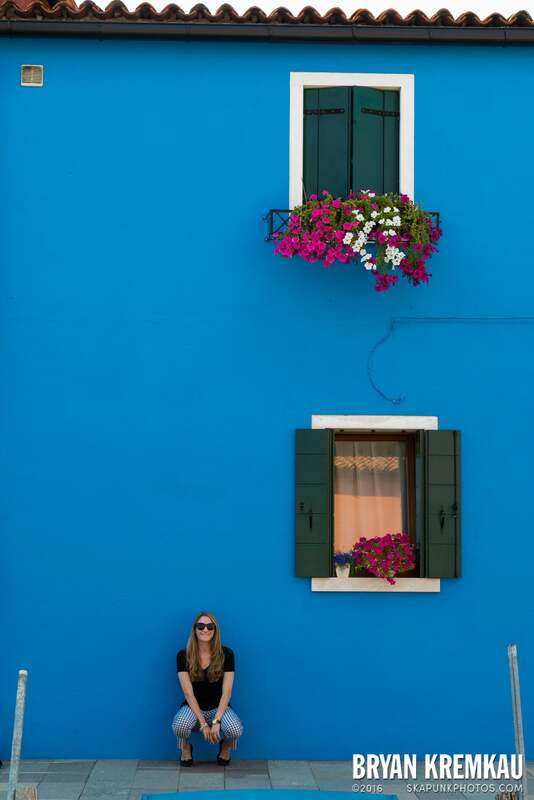 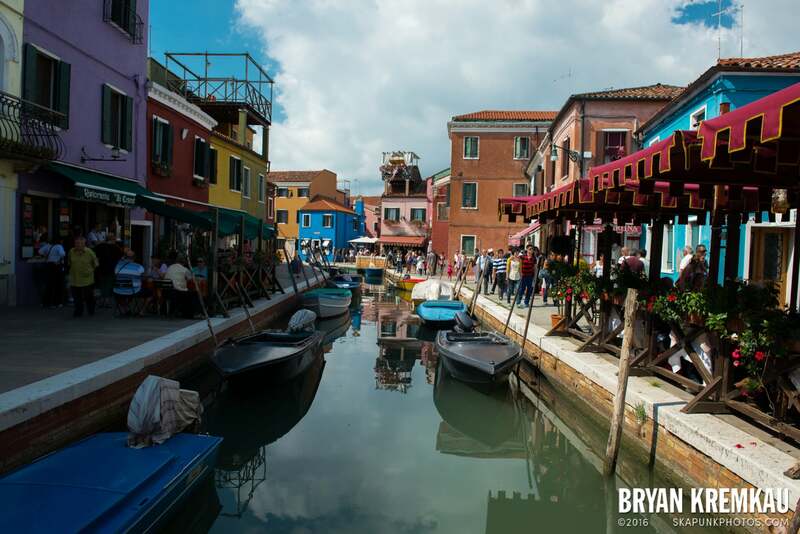 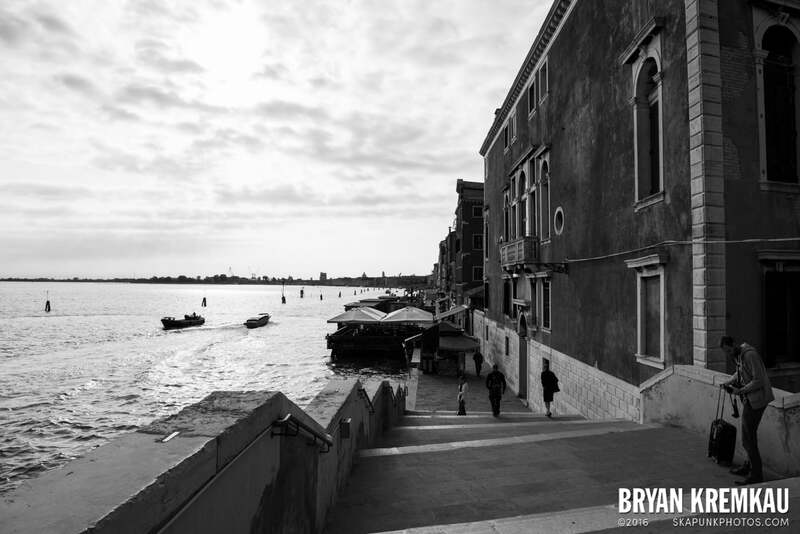 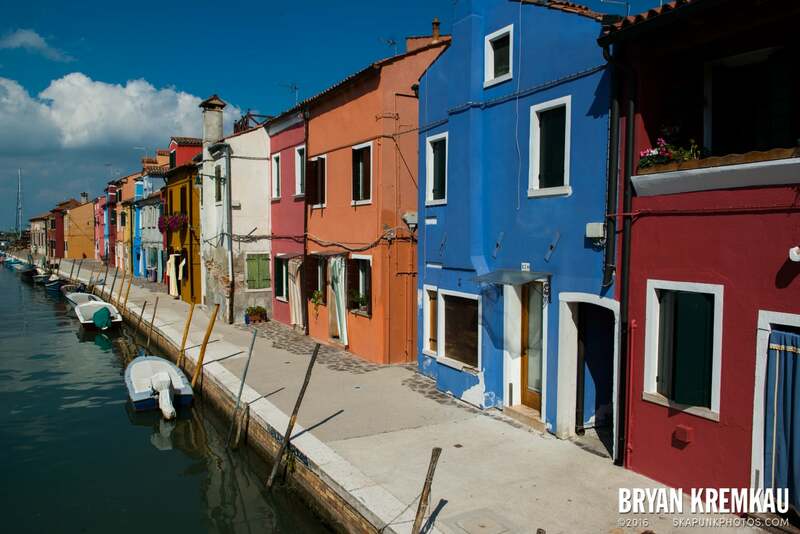 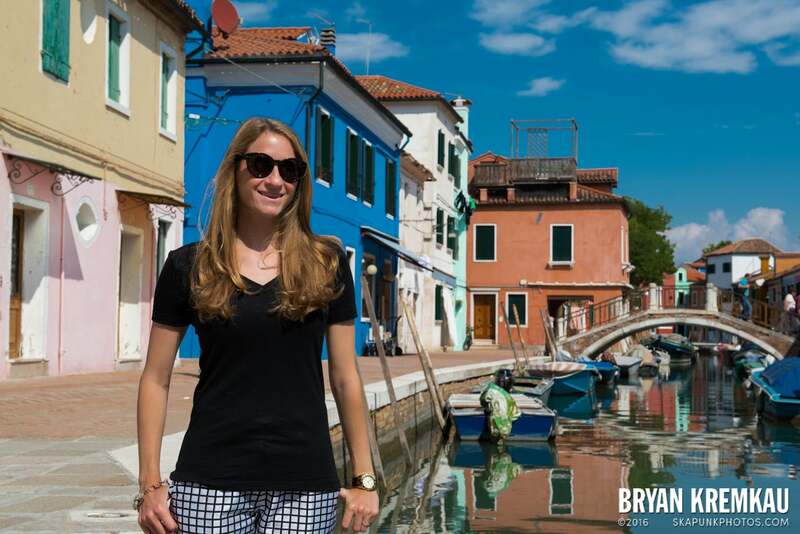 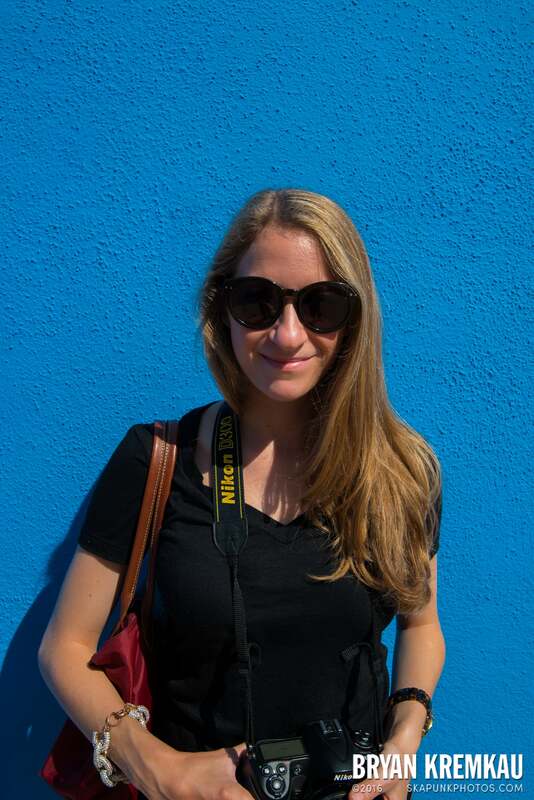 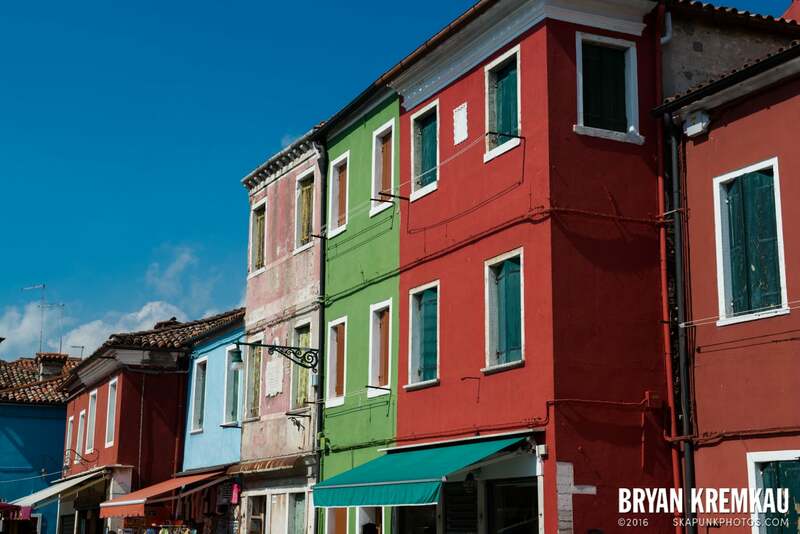 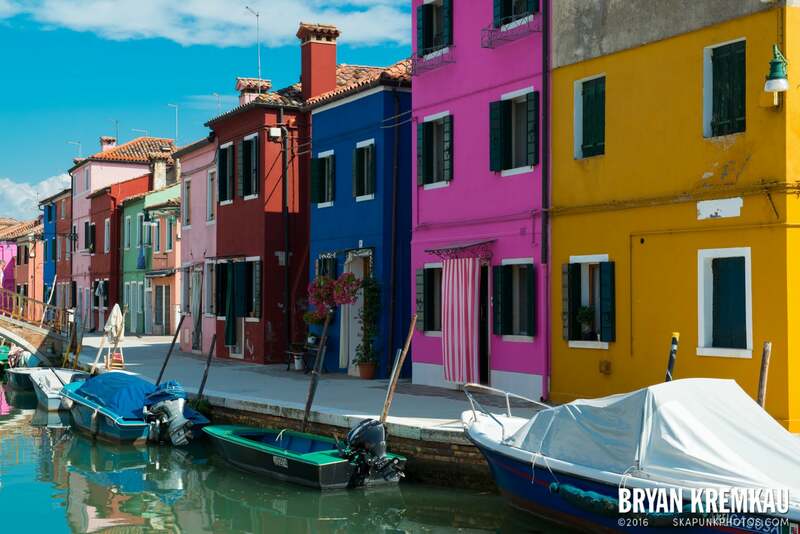 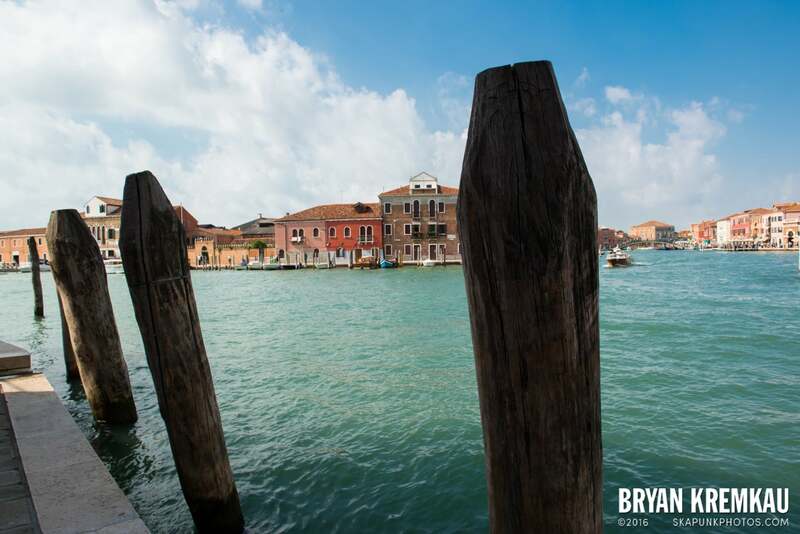 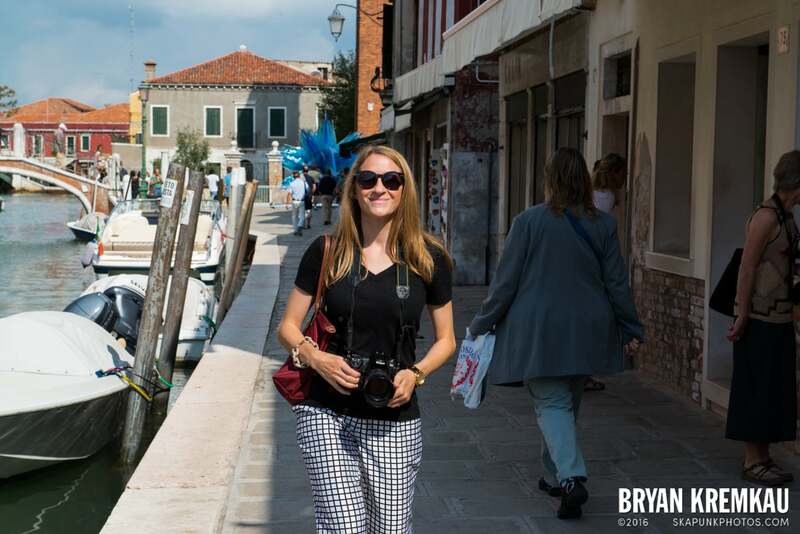 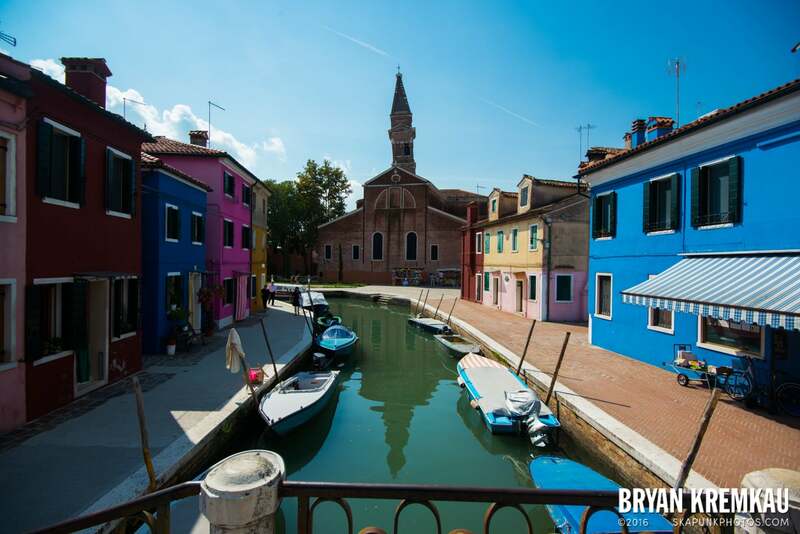 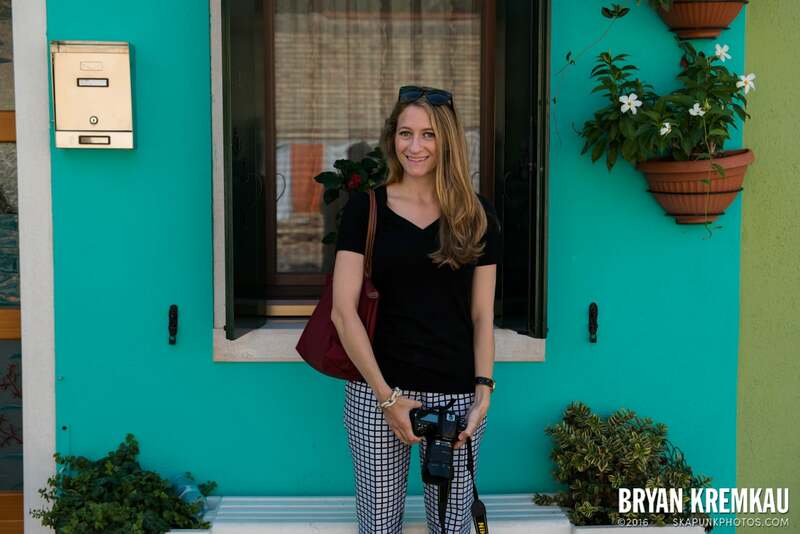 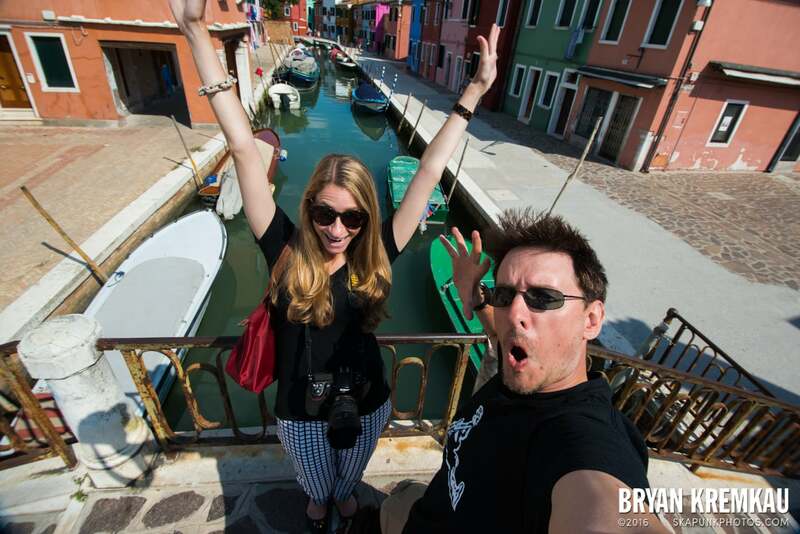 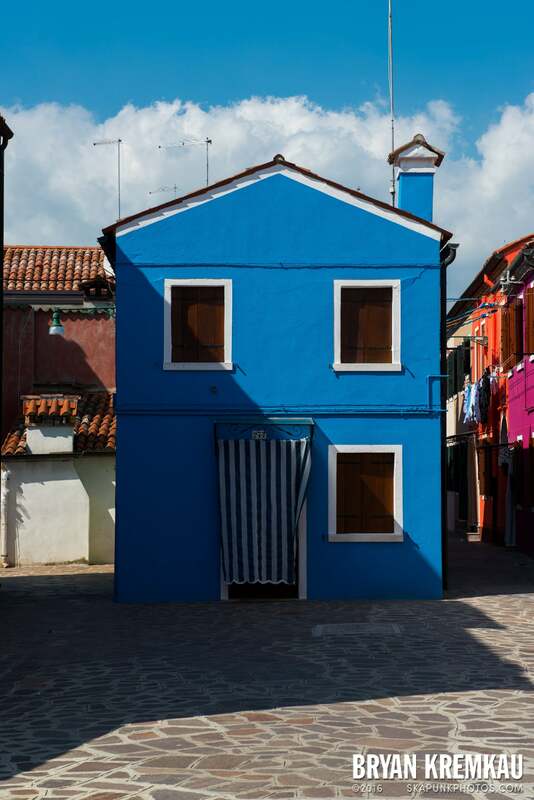 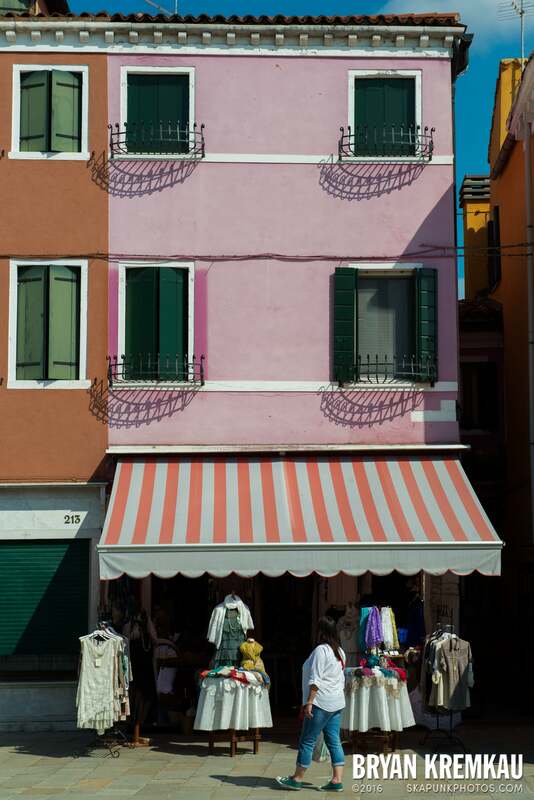 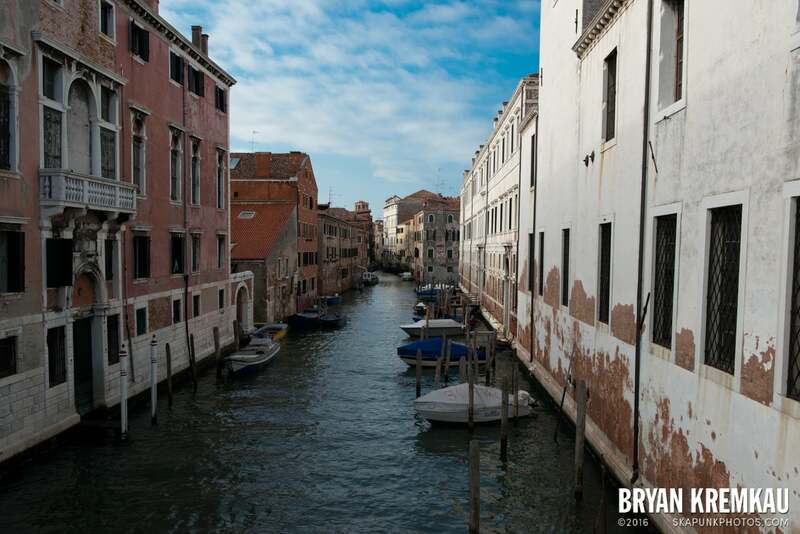 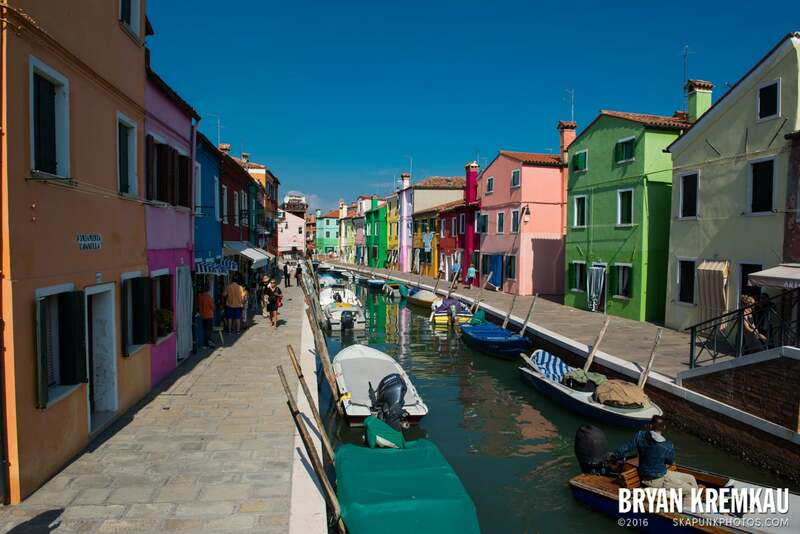 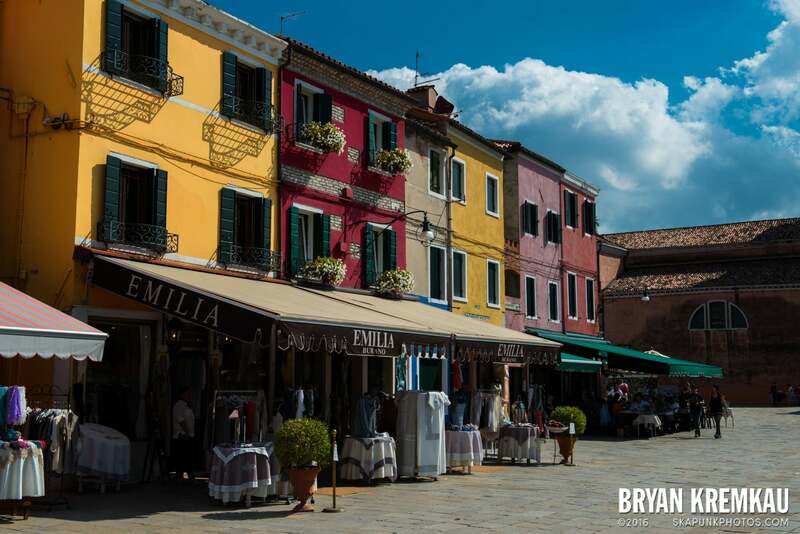 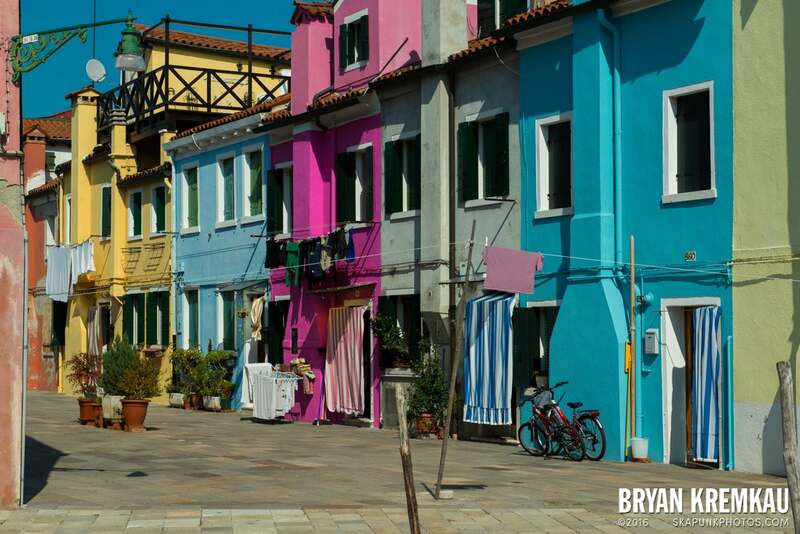 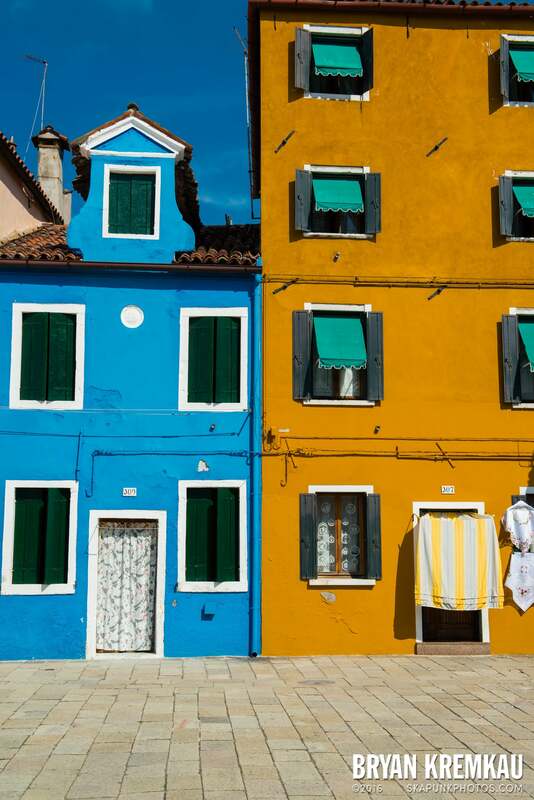 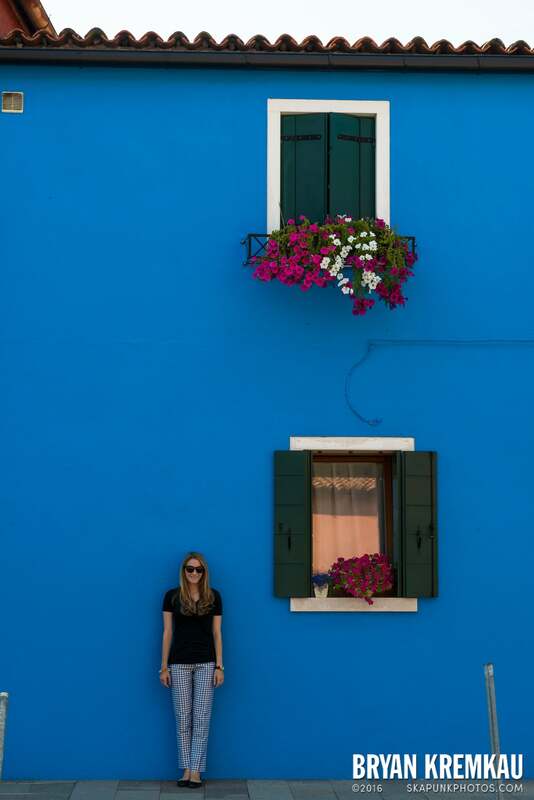 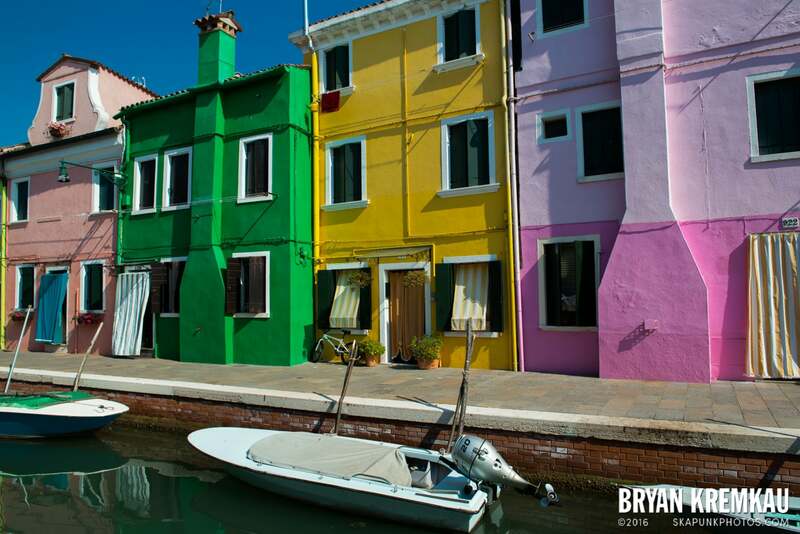 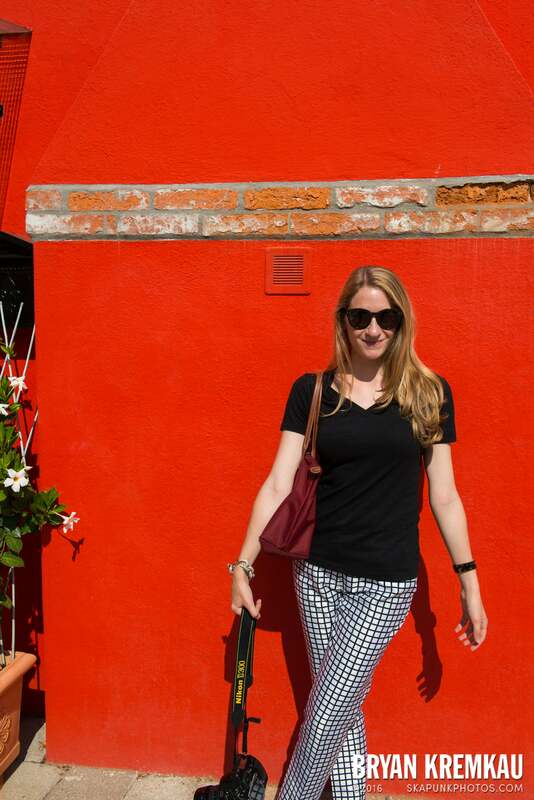 Burano is a must-see if you’re a photographer and going to Venice! 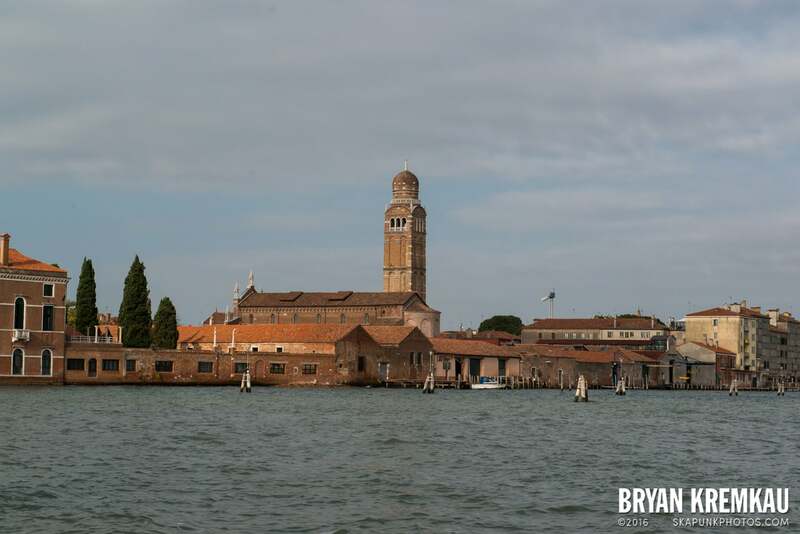 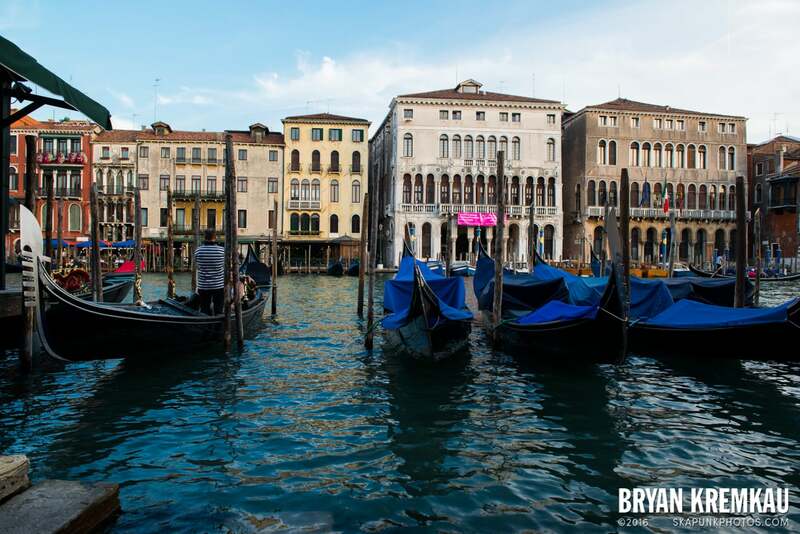 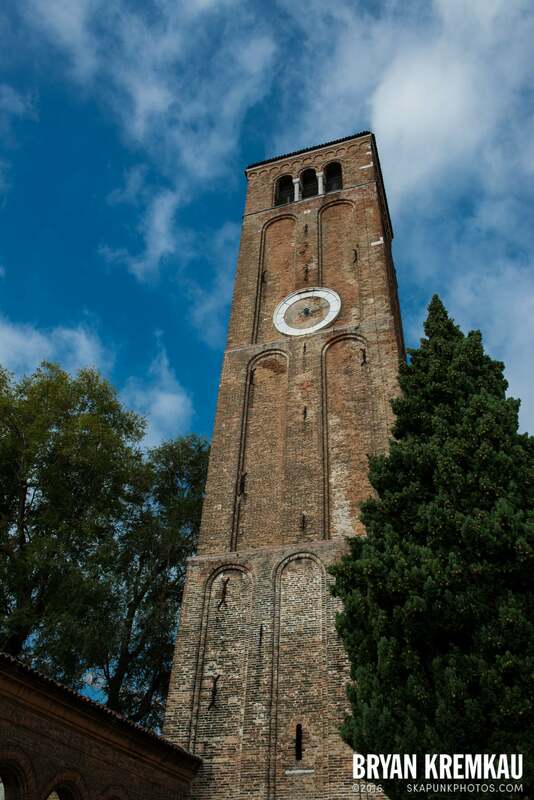 In order to get to Murano and Burano, you have to take a certain number vaporetto boat to get there. 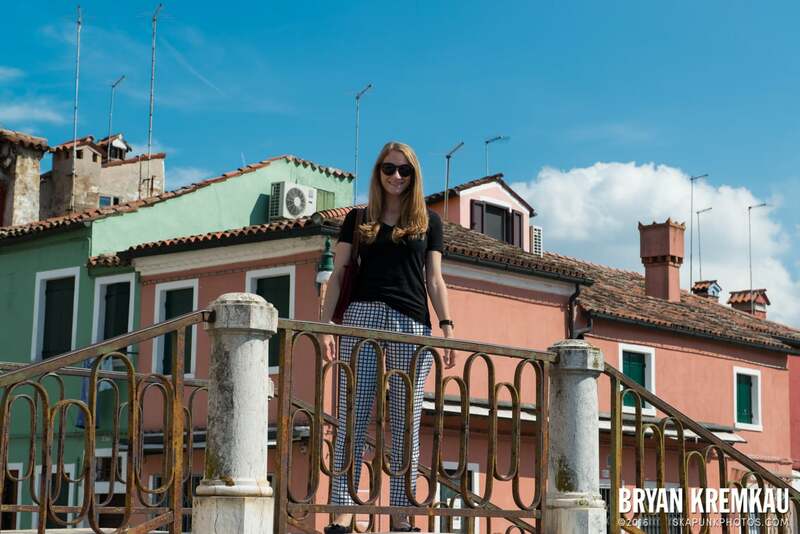 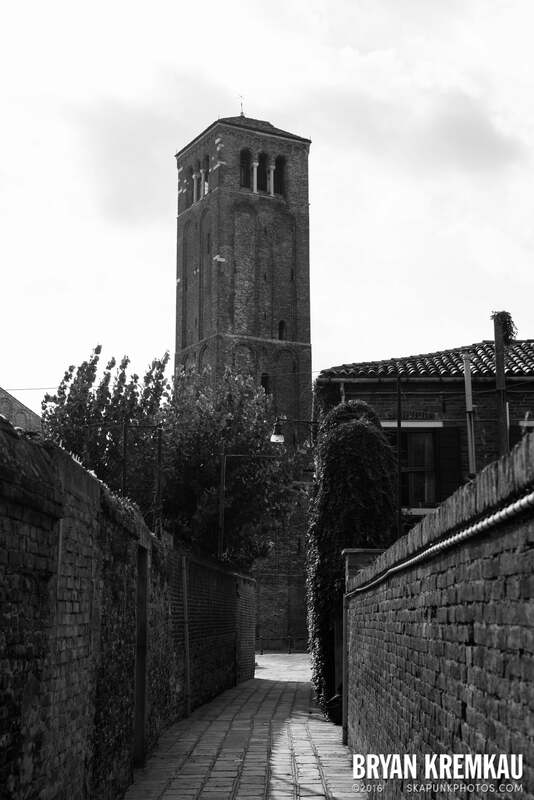 We walked up to Cannaregio and bought a pass that takes you to all the islands but with the time we wanted for the two islands, we didn’t see anything else. 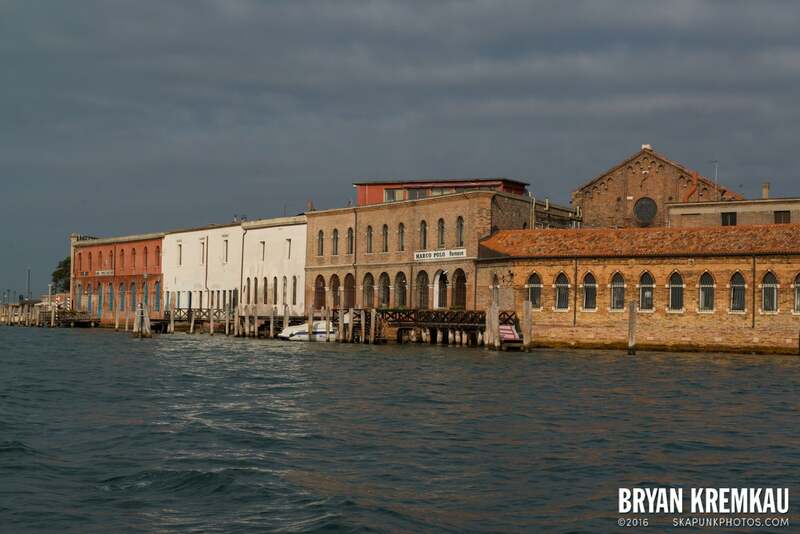 We got to Murano first and since it was early, no one was out yet. 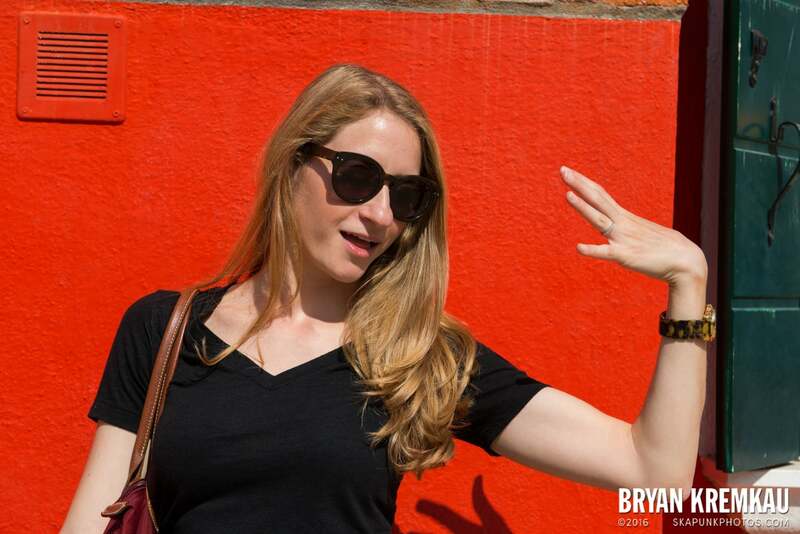 It being Saturday could have had something to do with that. 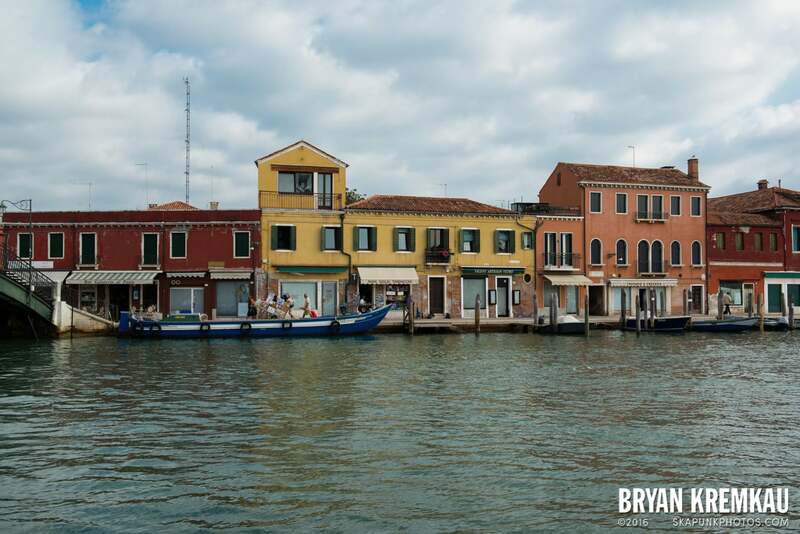 We walked around a little bit and then went to the small Glass Museum when it opened at 10am. 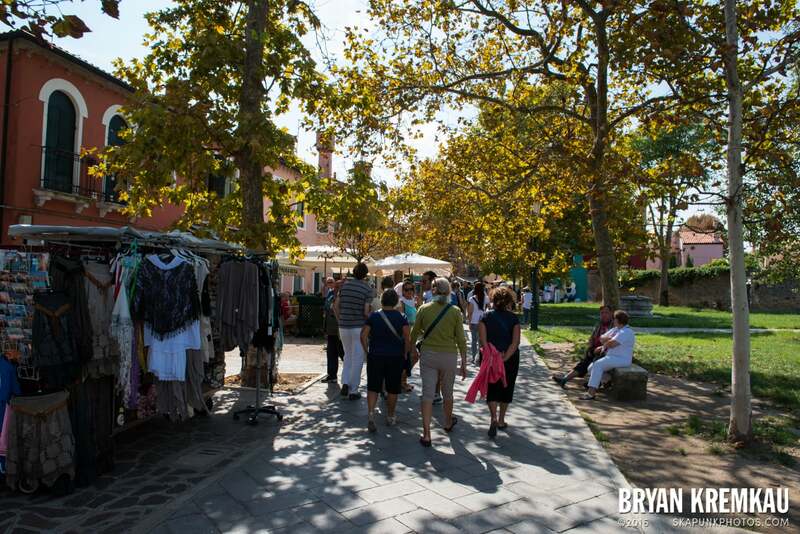 It was nice but I’m not sure if 8 euros is worth it. 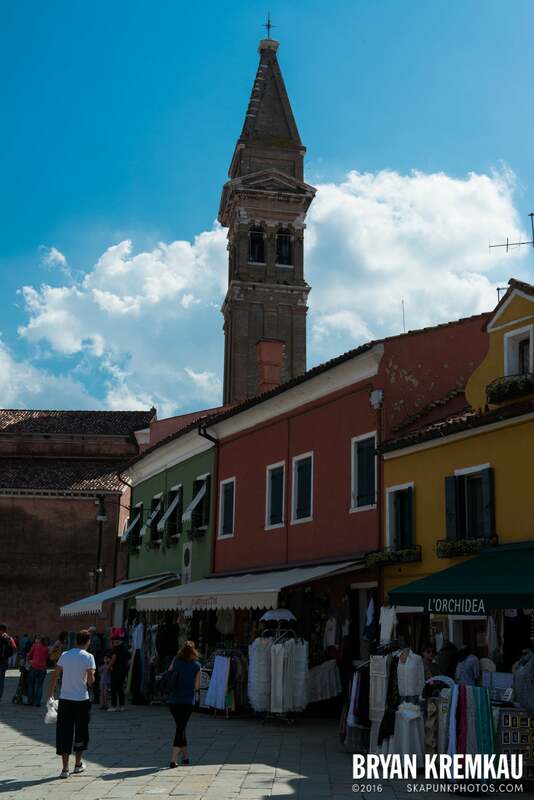 Kristen found some nice Murano glass at a jewelry place near Church of Santa Maria e San Donato. 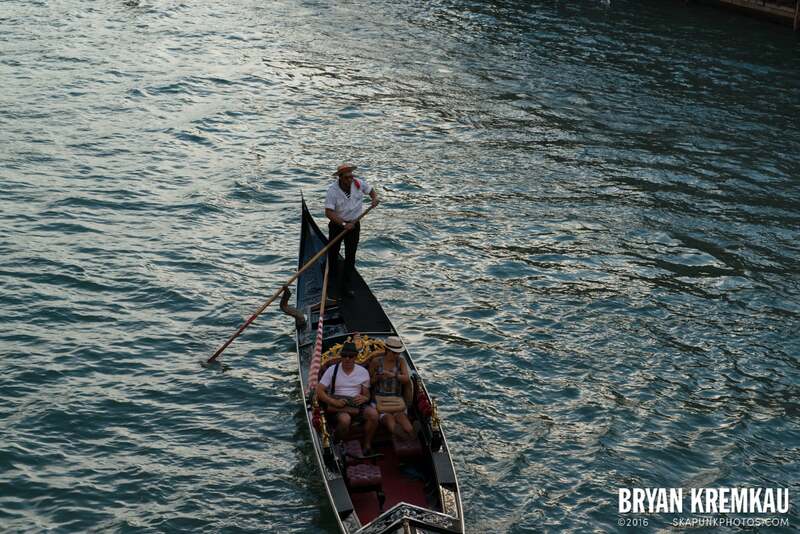 It was across the canal, and we ended up chatting with the guy for 45 minutes it seemed. 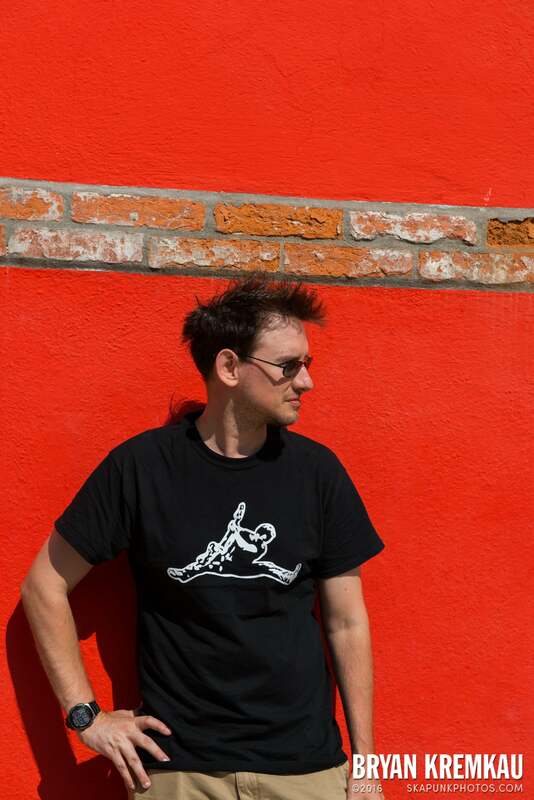 Very nice guy! 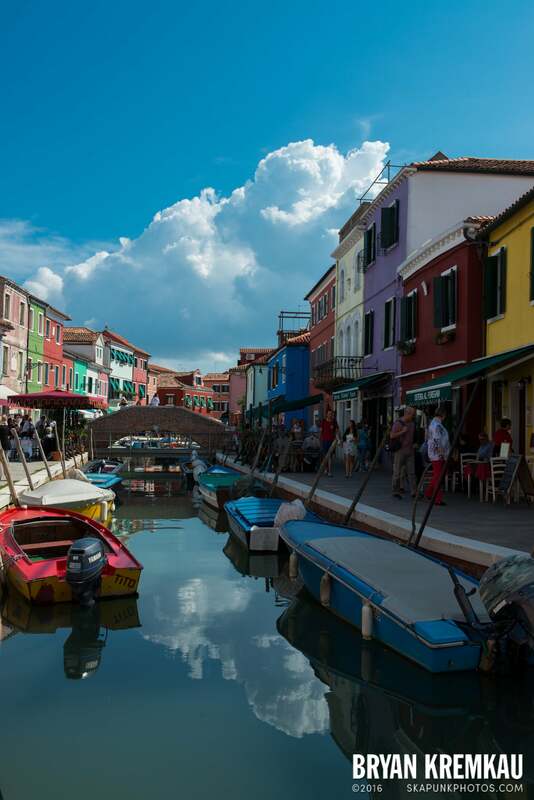 A lot of the Italians we met over there we very friendly to us, and mostly everyone spoke English so that helped. 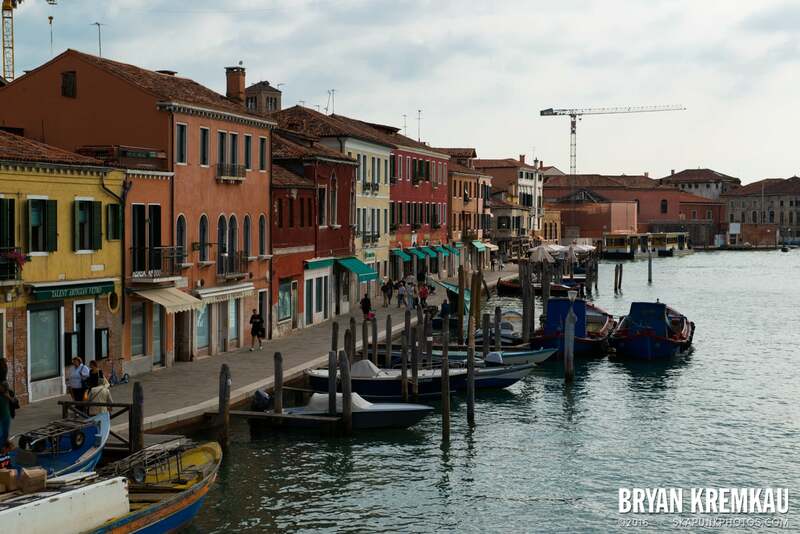 Even if some spoke Italian, you can still kind of tell what they were saying. 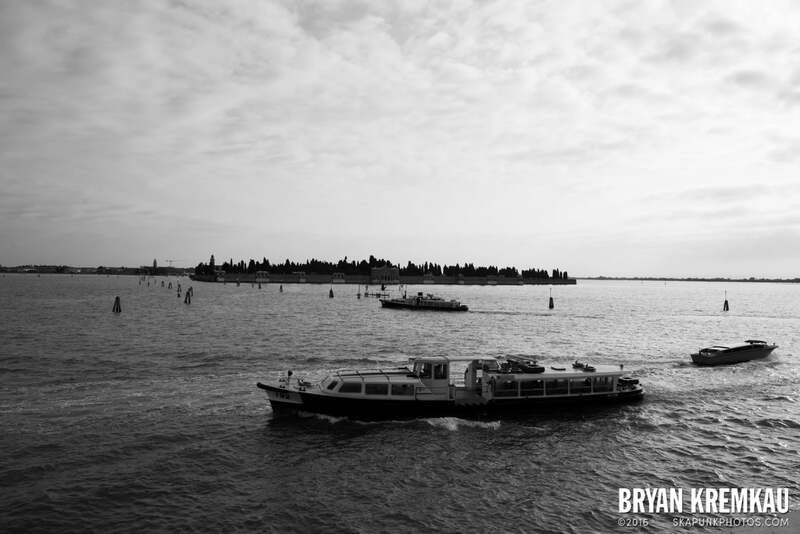 After Murano, we waited about 20 minutes for the boat to take us to Burano. 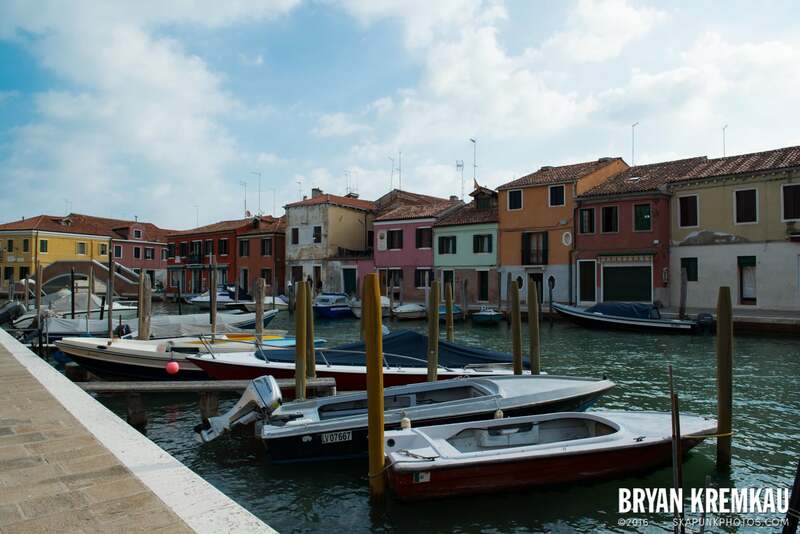 Be prepared because the boats get PACKED! 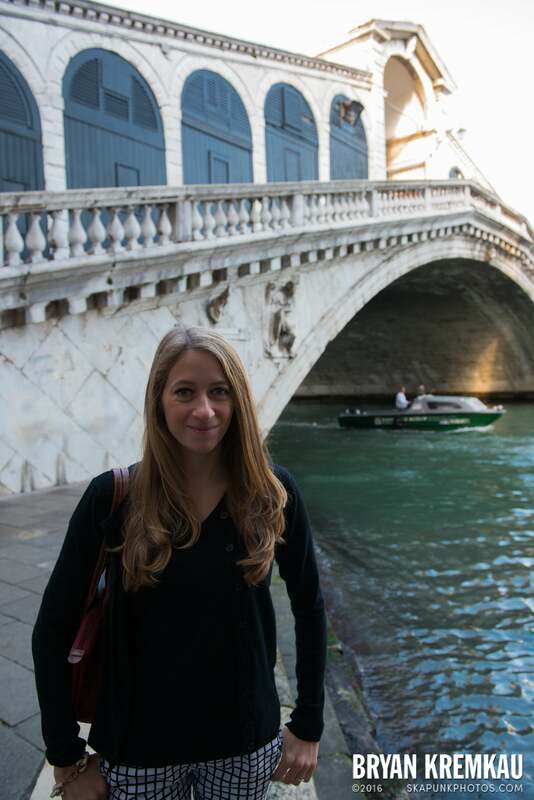 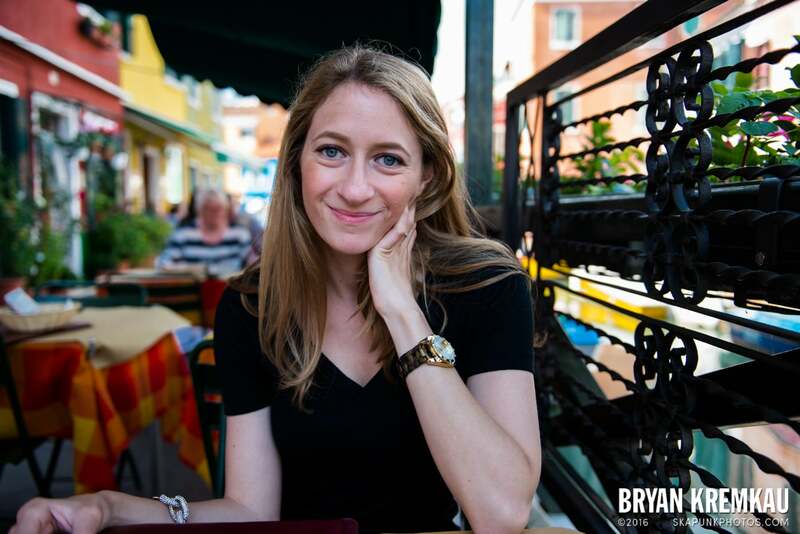 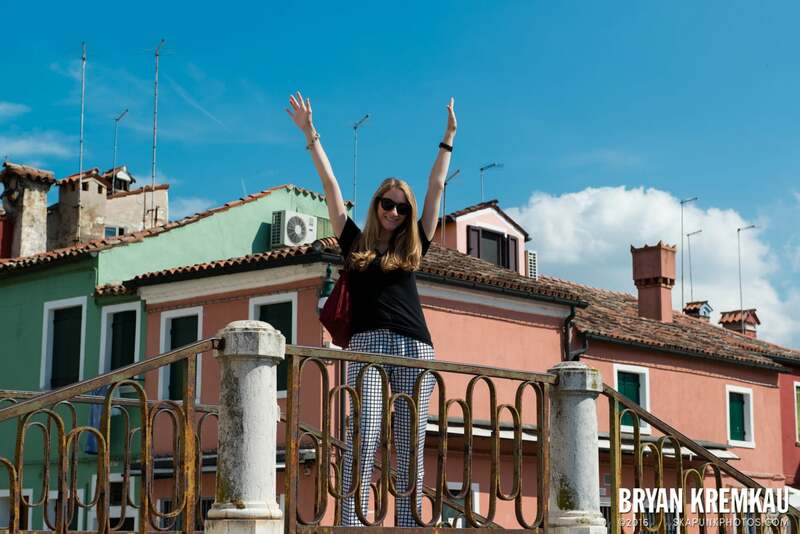 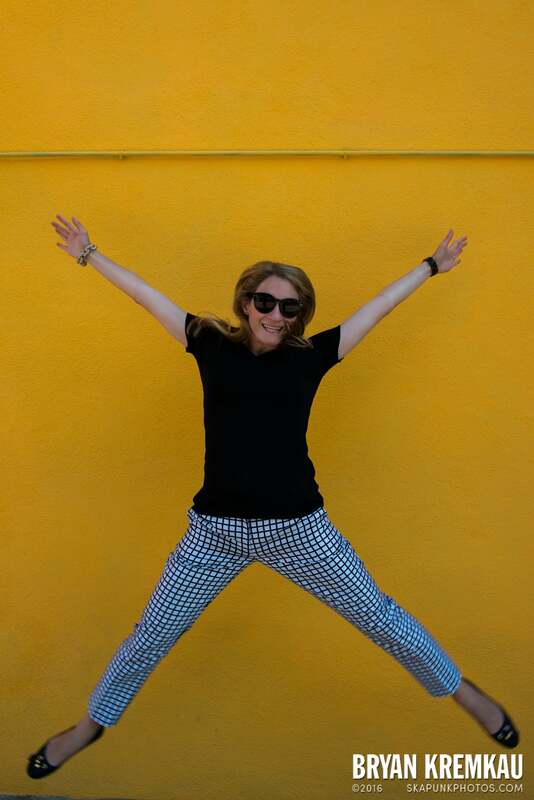 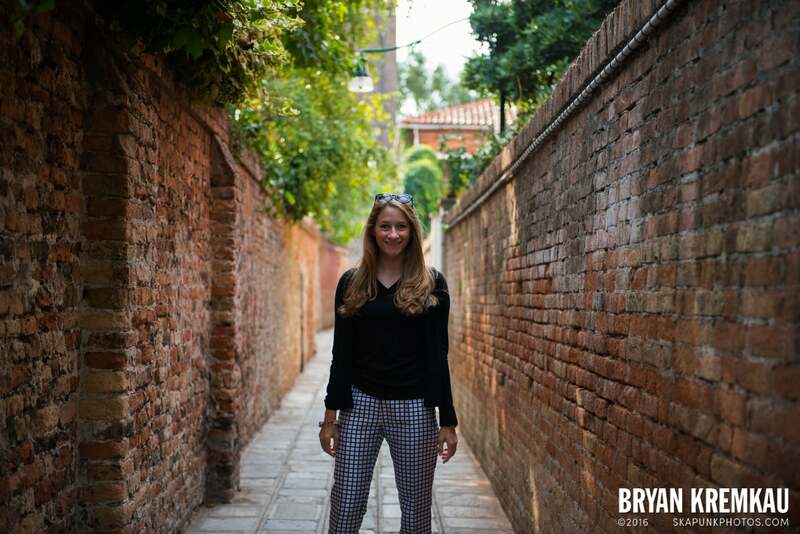 I had to stand up awkwardly trying to touch the ceiling for 20 minutes as we made our way to Burano. 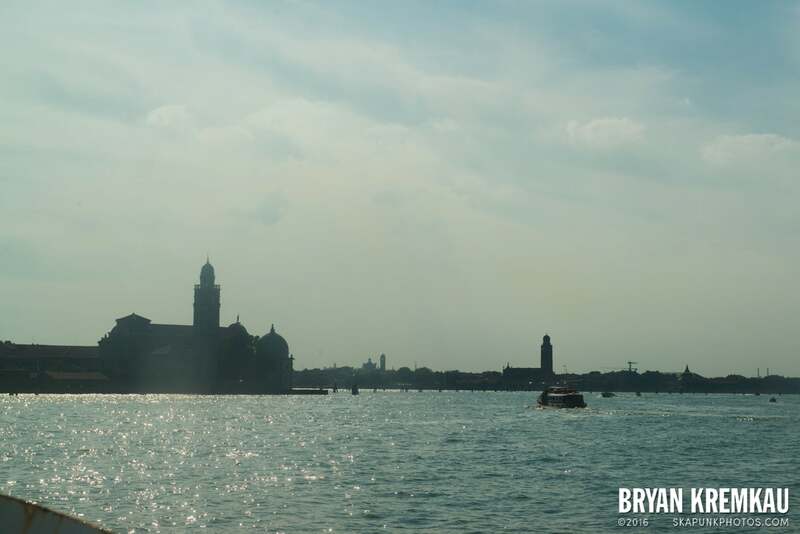 You just try to concentrate on other boats flying pass the vaporetto, or other islands you may pass. 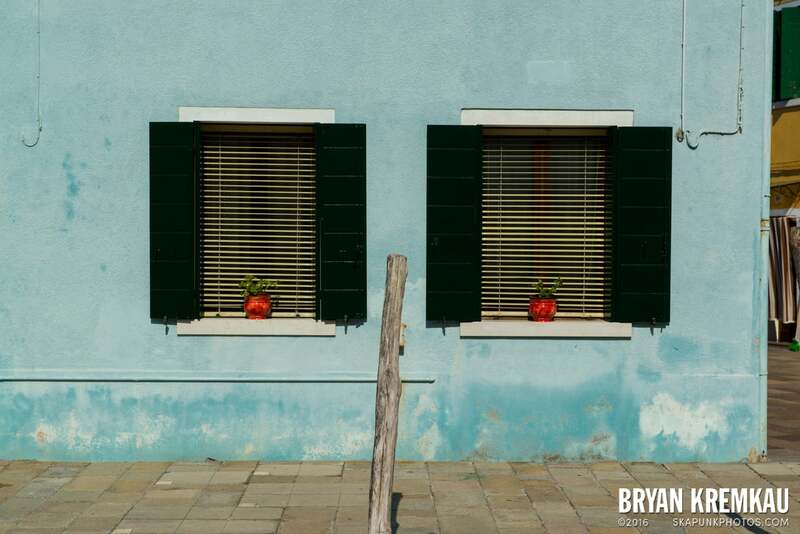 Kind of like how I feel on the subway, just stare away or at the ground haha. 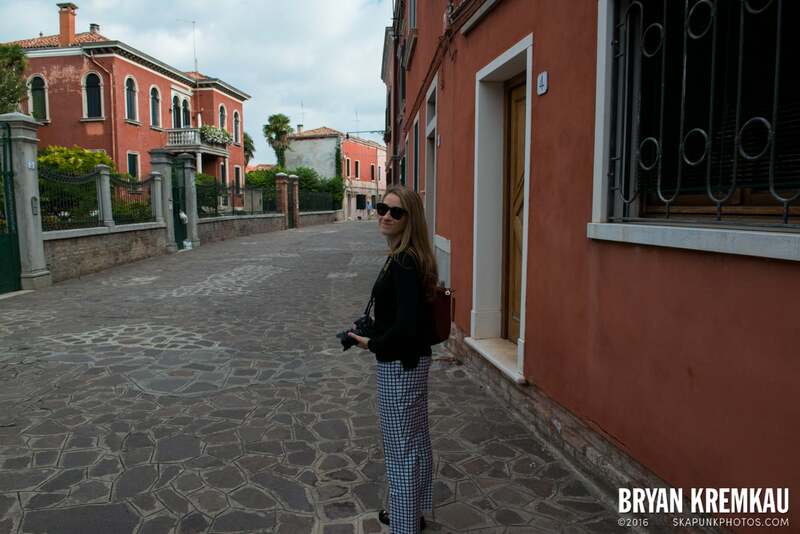 The first thing we did when we got to Burano was grab some delicious pizza since we were starving. 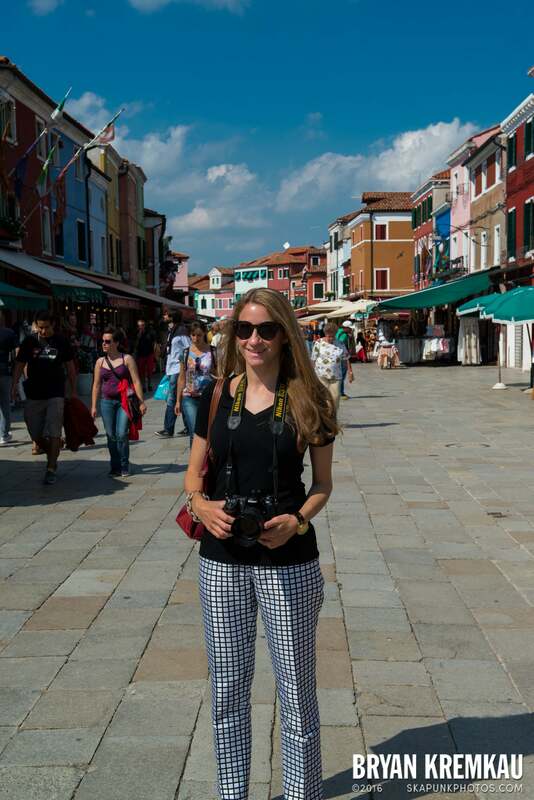 The pizza owner complimented me on my full frame Nikon camera, so that was nice to hear. 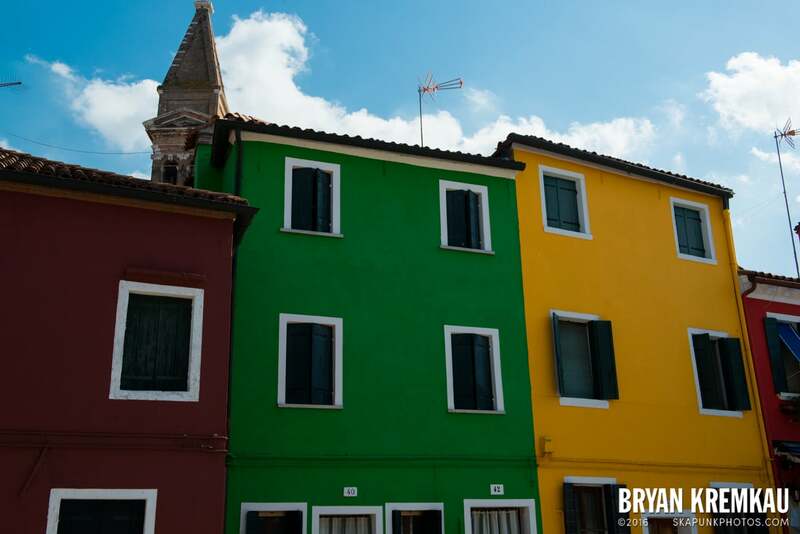 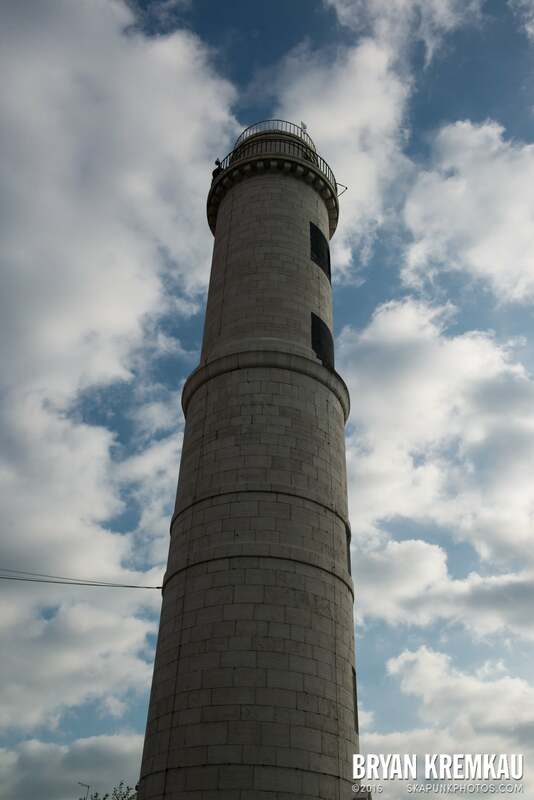 As we were eating, we just gazed around us as we saw nothing but colorful buildings. 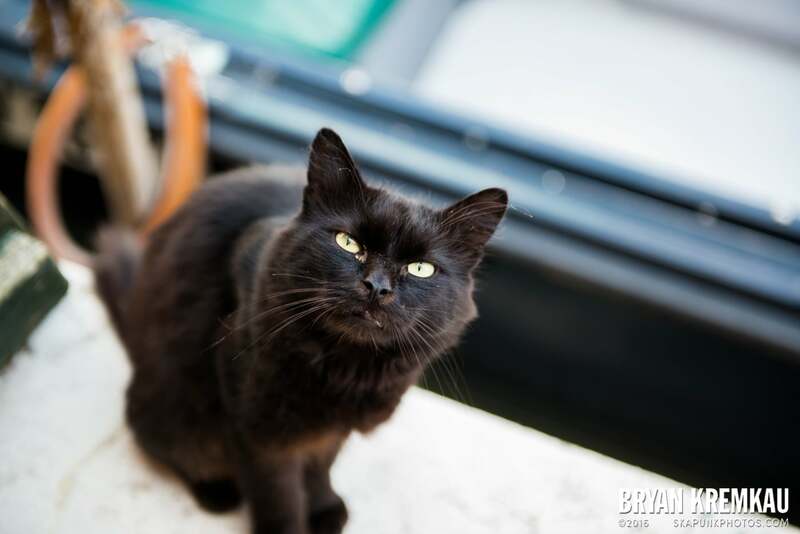 Plus we had a furry friend wandering around our table, hoping to get some food. 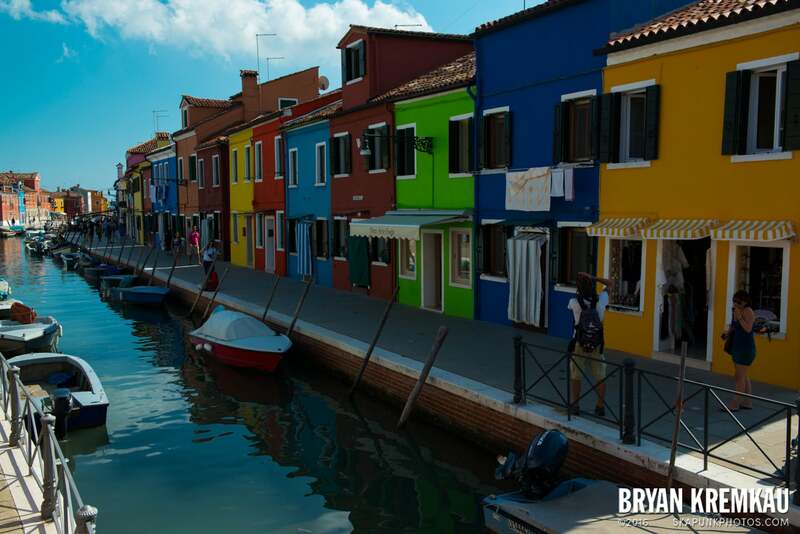 After getting a much needed lunch, we just walked around most of the island and were amazed how colorful the buildings were. 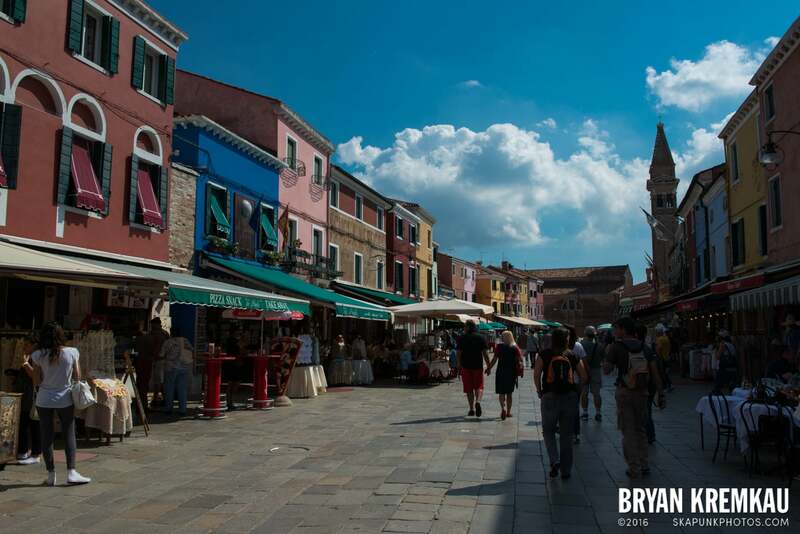 Out of the two islands we saw that day, Burano was by the far the more crowded one. 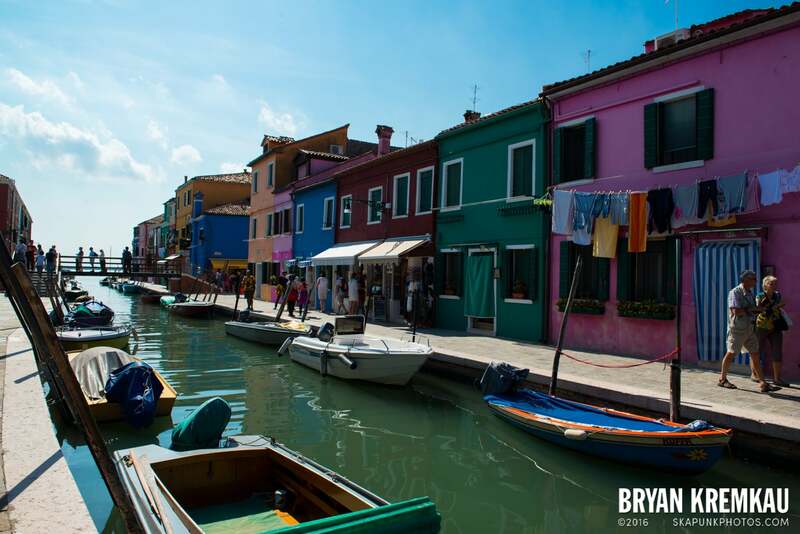 Many people were there to check out the lace and photograph the colorful buildings. 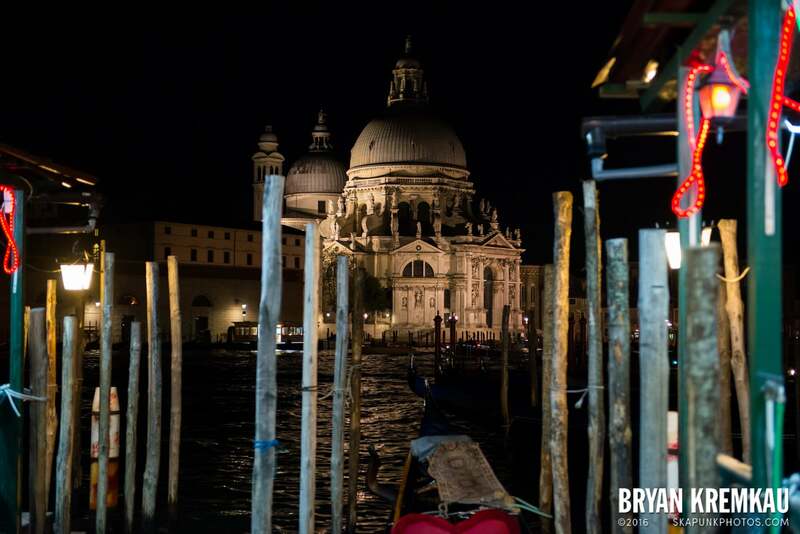 It’s a photographer’s paradise, except a lot of people will probably have the same photos as you. 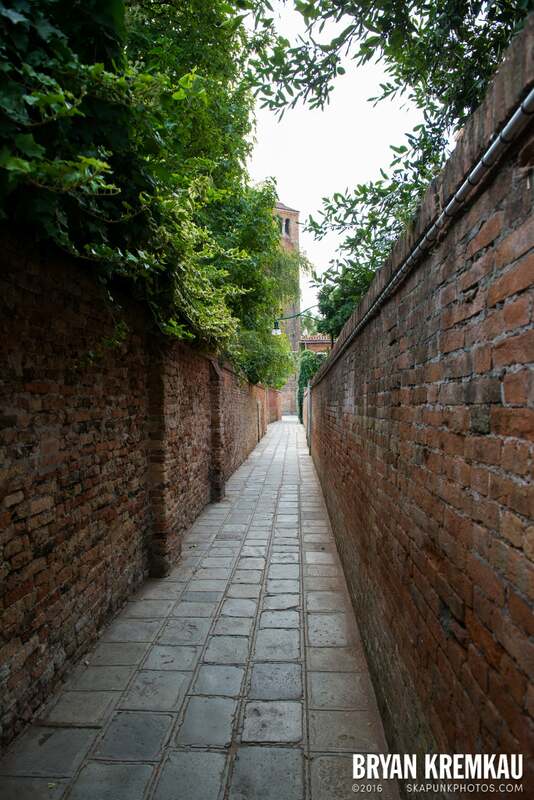 We probably could have stuck around longer than we did there but we both were pretty beat so we headed home after walking around a little bit. 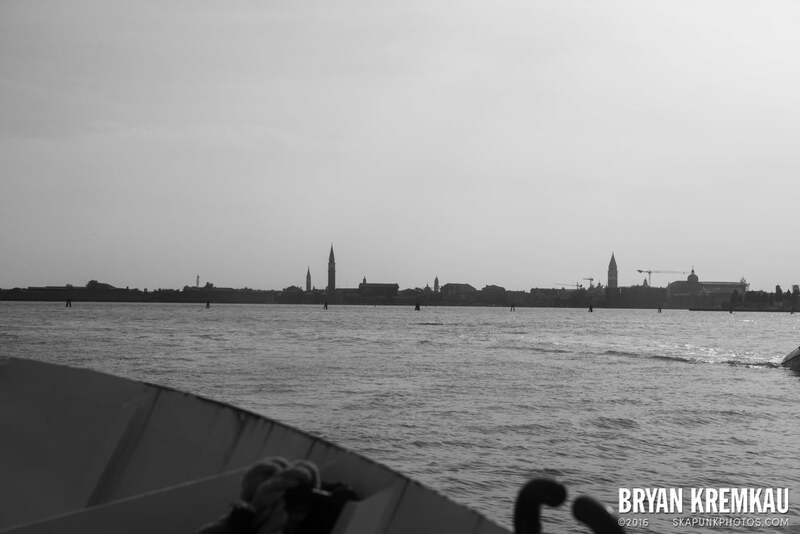 We ended up sitting/standing in line for the boat for over 20 minutes and quickly found seats since the ride was 40 minutes long back to Venice. 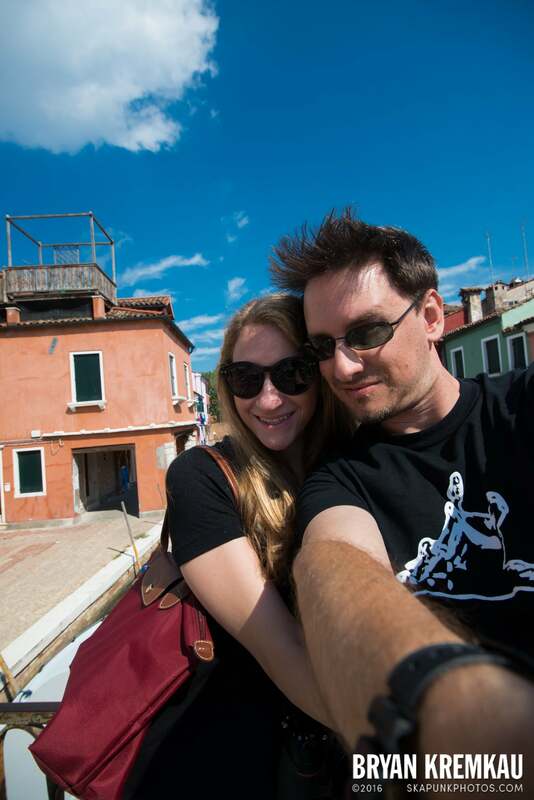 I ended up dosing off a little bit and doing some shaky video in front of the boat. 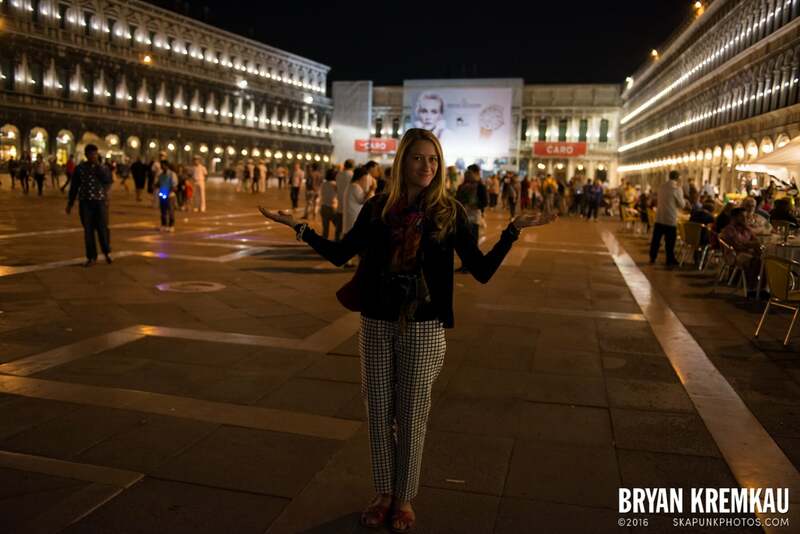 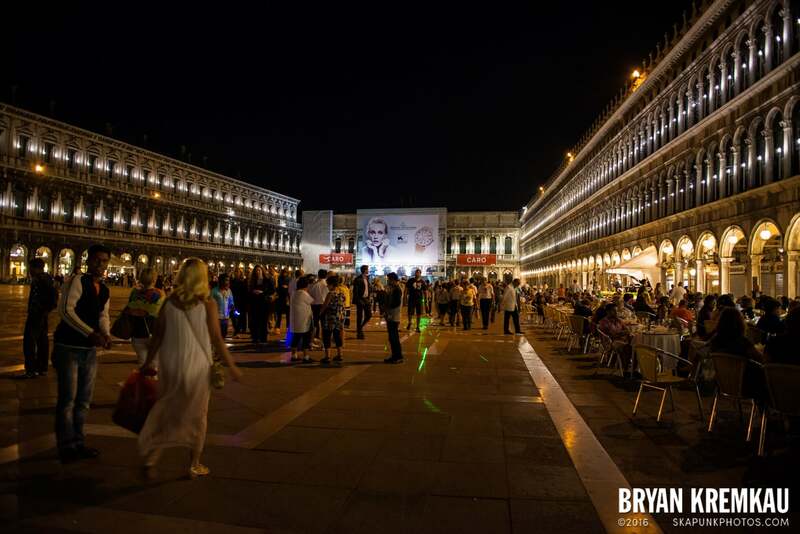 Later on that night we had one more meal in Venice and strolled around San Marco again and watched some of the orchestras play. 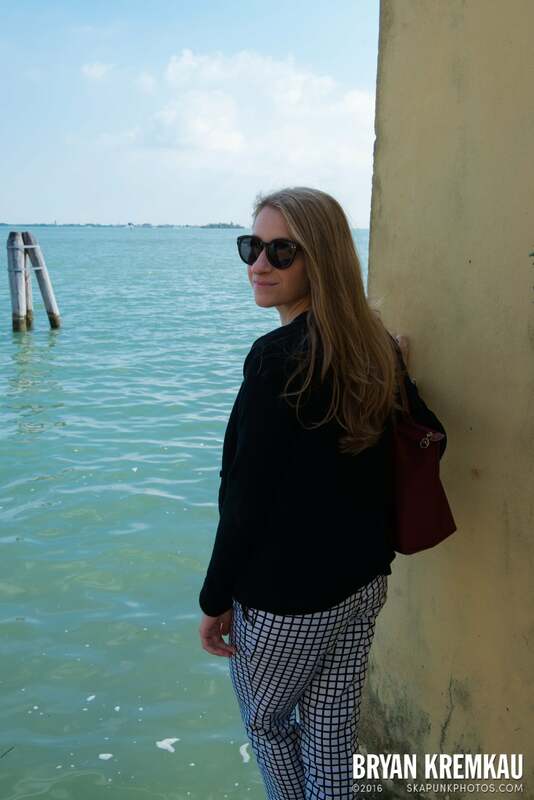 It was nice watching those. 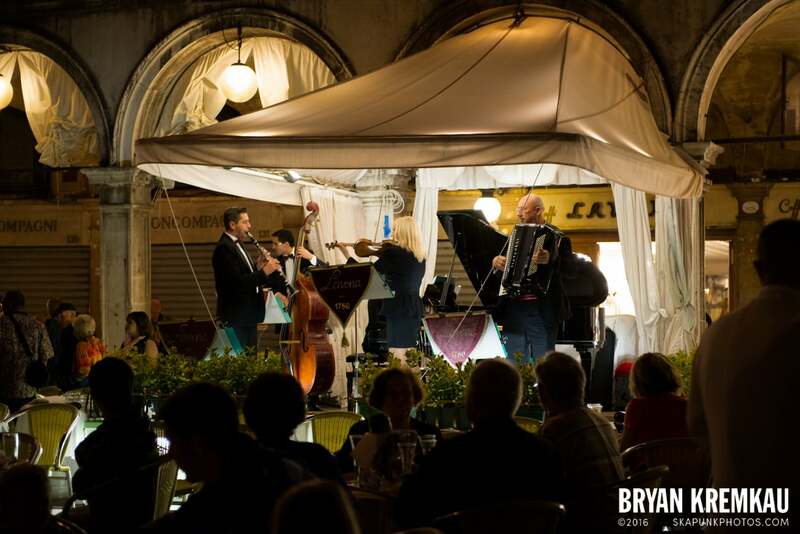 Each restaurant had their own orchestra play, they play a few songs and then take a break. 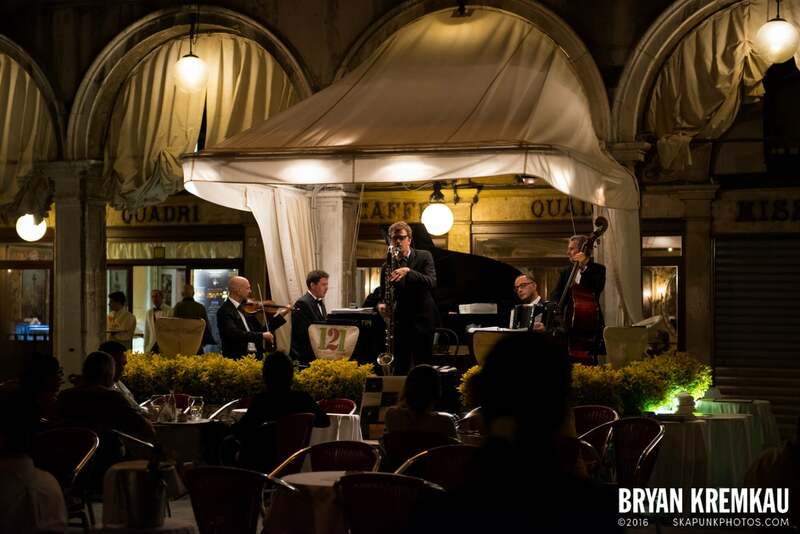 Then you move on and watch another perform. 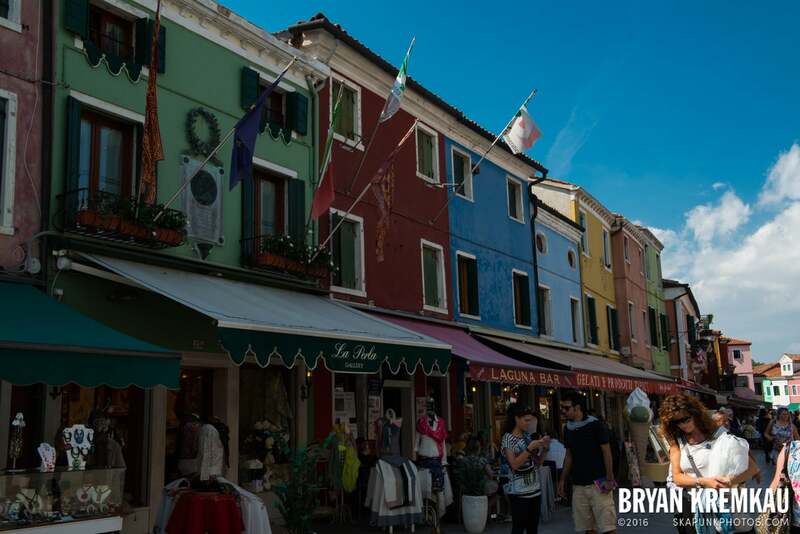 That is, if you didn’t have it with the merchants trying to annoy the crap out of you with trying to sell flowers or glowing toys. 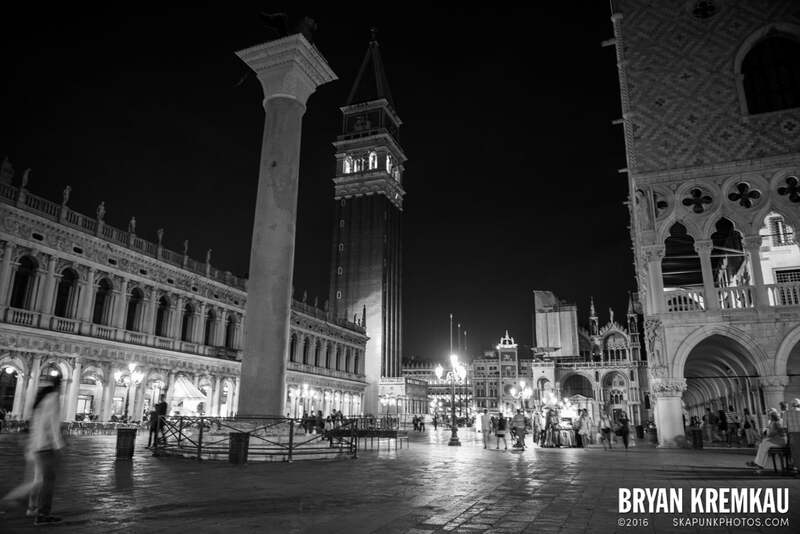 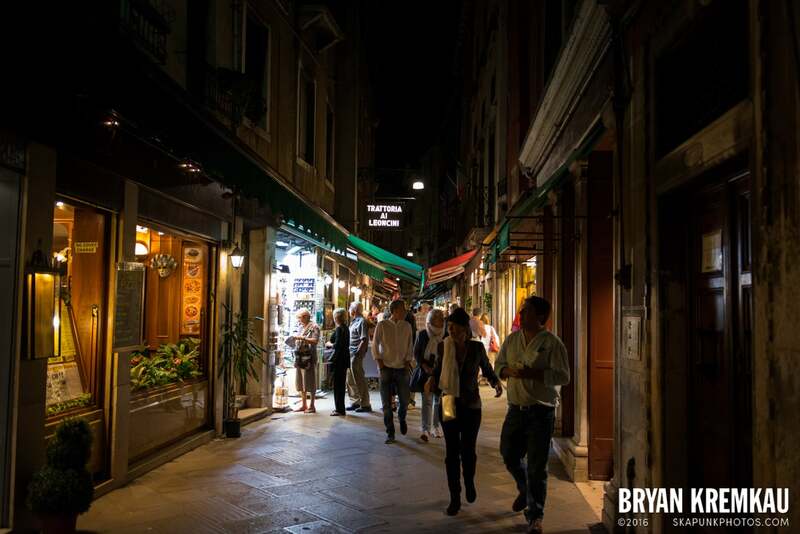 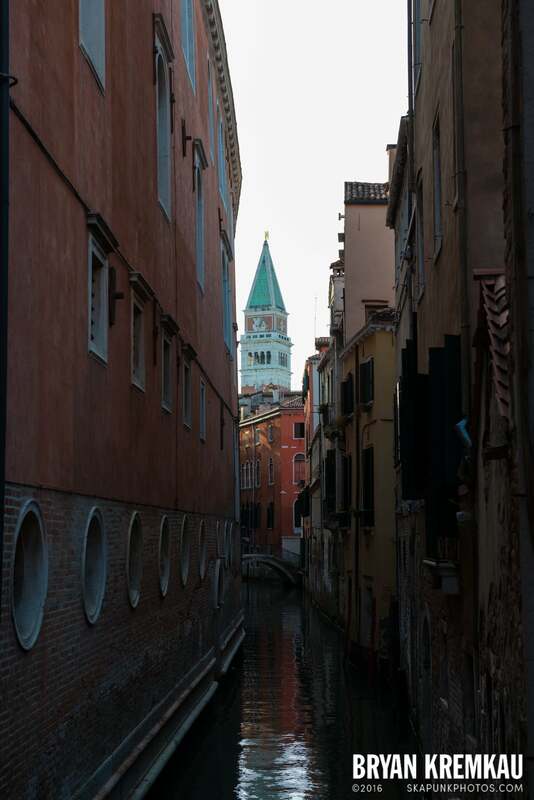 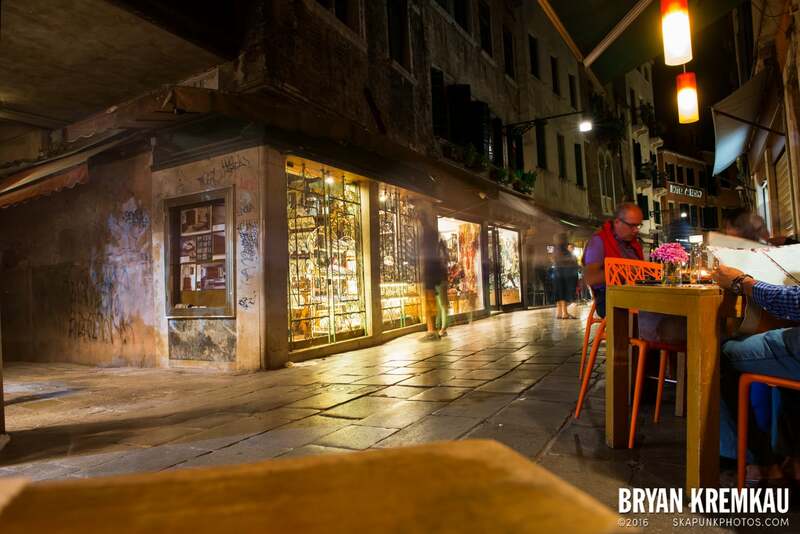 Venice is really quiet at night, and dark too. 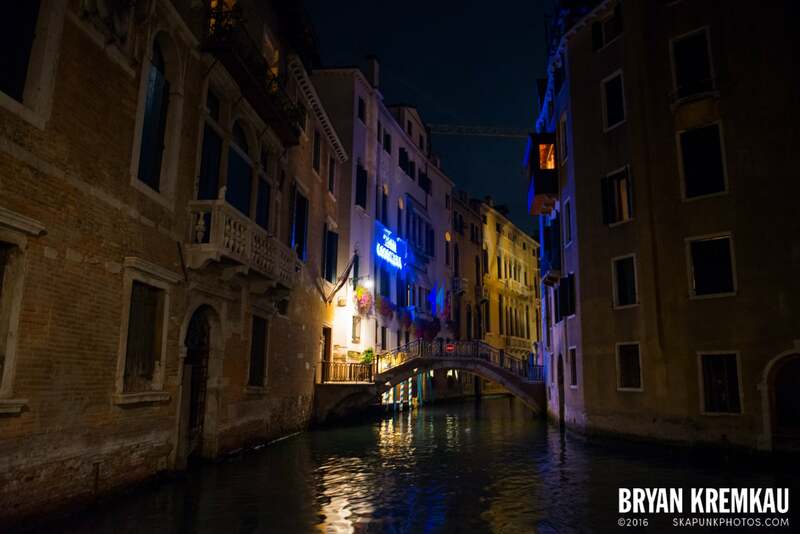 It’s not as well-lit as Rome or Florence at night. 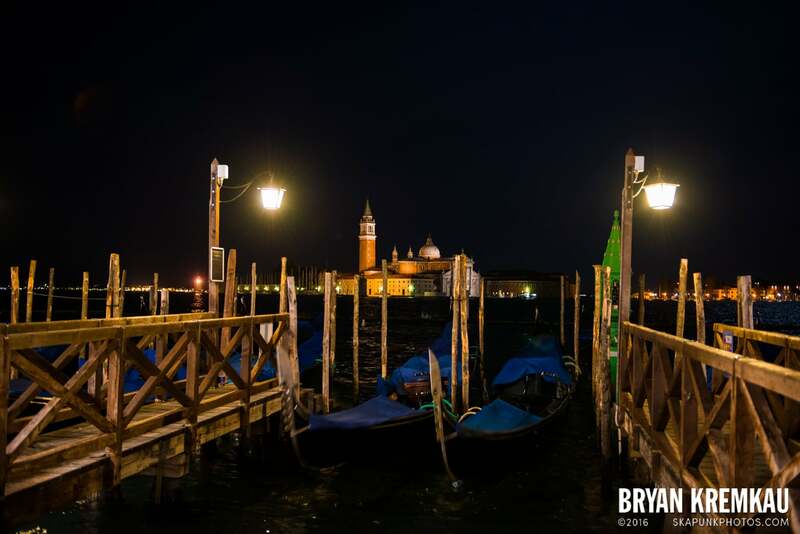 Many of the tour groups are gone (thankfully) so it gives you a nice relaxing feel at night.